View Our Navionics Lake Maps API - Sardis, Enid, Grenada, and Barnett Lakes at 1-Foot Contours - Enjoy!!!! Kent Driscoll and John Harrison added another championship win to their belt making it two-in-a-row. That’s right, 2015 on Enid & Sardis, 2014 on Sardis & Enid, Grenada 2011, and 2nd place 2013 on Barnett; three times Club Champions and 2 in a row, wow!! These guys are great fishermen and also great guys. 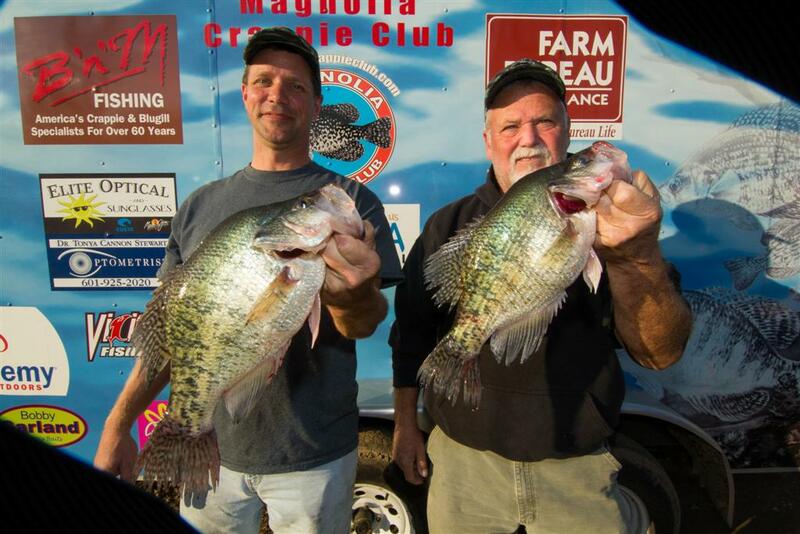 They’re renown crappie fishermen; having been featured on numerous television shows and outdoor articles. It’s hard to find words to describe this fishing team. All I can say is they grind it out till the end. They never quit or give up. John says, “We struggled on Saturday. We fished 11 total spots. Our best fish came in the last 30 minutes of the tournament. We pulled bandit cranks on B’n’M 18’, 16’, and 12’ poles for a while. “We used 15# Vicious Moss Green Braid to get our cranks down to the 12’ level the fish were holding. We like the Vicious Braid because it’s the same diameter as 4# mono. We can let out less line and still get our depth. The short line set allows us to make tighter turns without tangles. Making tighter turns allow us to ‘Circle the Wagons’ when we get a good fish. In other words, we can turn around quickly and get back on the fish. This is necessary when the fish are scattered and hard to locate”, said Kent. Every so often we see a fishing team come along that’s wins and wins often. It’s no different in other sports especially fishing. 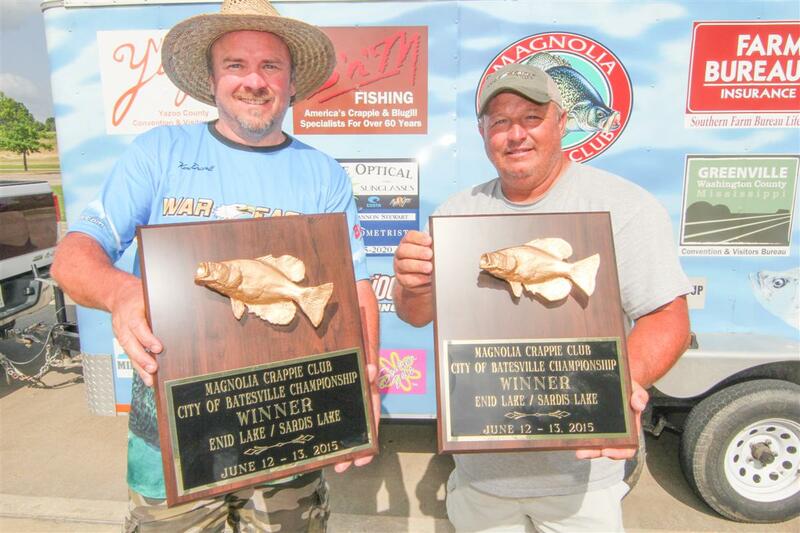 Well MCC has just that team; Jeremy Aldridge and Clint Egbert are our 2015 Anglers of the Year. 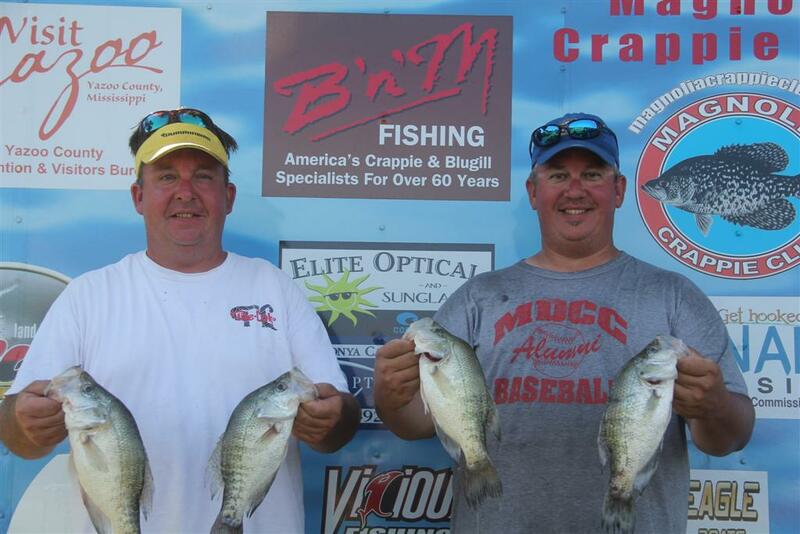 This is their 2nd year fishing with MCC and 2nd year on the national circuit. Last year these guys won two club tournaments and finished in the top five Angler of the Year Points Race. 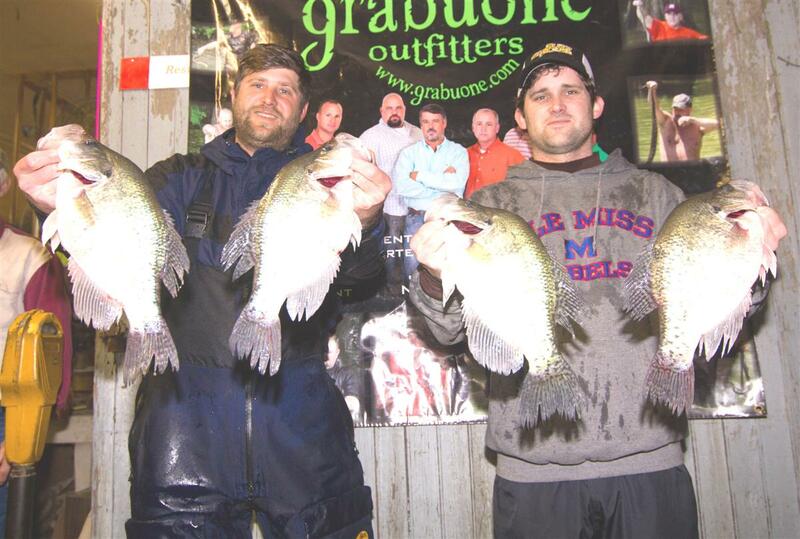 Not only did these guys do well in MCC tournaments, they hit Crappie Masters with a storm. 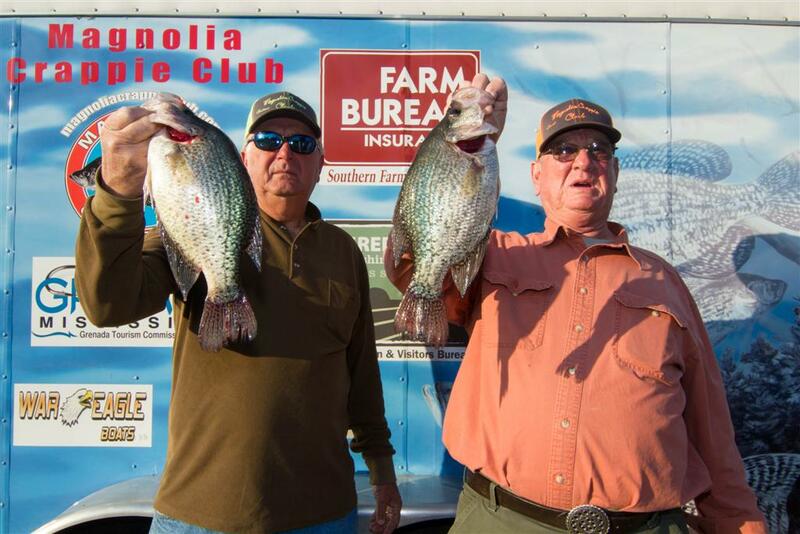 They finished 2nd in the 2014 Crappie Masters MS State Championship at Grenada, MS and 7th in the 2014 Crappie Masters National Championship at Greenville, MS. Talking about hot, these guys are smoking. At first I thought it was just luck; not so, they’re excellent fishermen. They fish methodically, they make every bite count. Being a writer, I get to interview the winners. I’ve become well acquainted and friends with both Jeremy and Clint. Jeremy is the spokesman for the team, that’s why I really like to interview Clint. I know fishermen will stretch the truth; not saying Jeremy is a liar, I just prefer to talk to Clint. 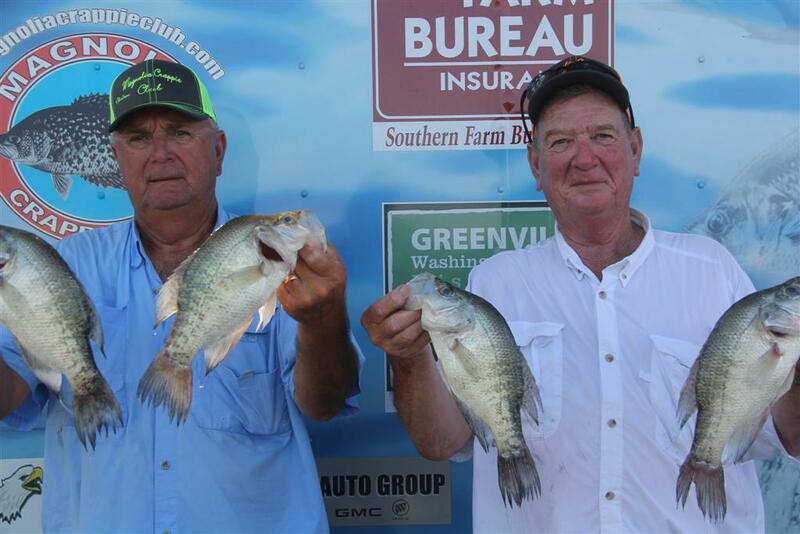 Congratulations to Jerry Gross & Bill Burnett with 13.39#’s. That’s an excellent weight for these two “Brush-Hogs”. These guys power trolled the Hurricane area along side numerous boats to catch their big stringer. This is tournament win number two for Bill and Jerry. This win cemented their top-5 place in the Angler of the Year race. The Sardis weight was their 2nd heaviest weight for the year. I’ve got to give them credit for their team-work and their consistency. Good job my friends; home-field advantage has its privileges. Just wait until next time……. Brad Calhoun & Tommy Moss finished 2nd with 13.07#’s and the Big Fish (2.58#’s). These guys did something no one would believed. They jigged fished 20’ water with 16’ B’n’M BGJP poles in each hand to catch several pre-spawn fish. Kim Gray & Vic Finkley finished 3rd with 12.52#’s. They fished the Hurricane area of Sardis and caught the 3rd Big fish of the day. These professional guides are well known on Sardis. They make their living doing what they did on Saturday. Way to go Uncle Vic and Kim(Super-Chicken). Vic & Kim are one of several teams using a Minn Ulterra. According to Vic, “It’s a dream to fish with that motor. I’m 75 years old, I don’t need to be getting up, hanging over the front to pick up the trolling motor. This thing makes fishing fun. I love it”. Way to Go…………. 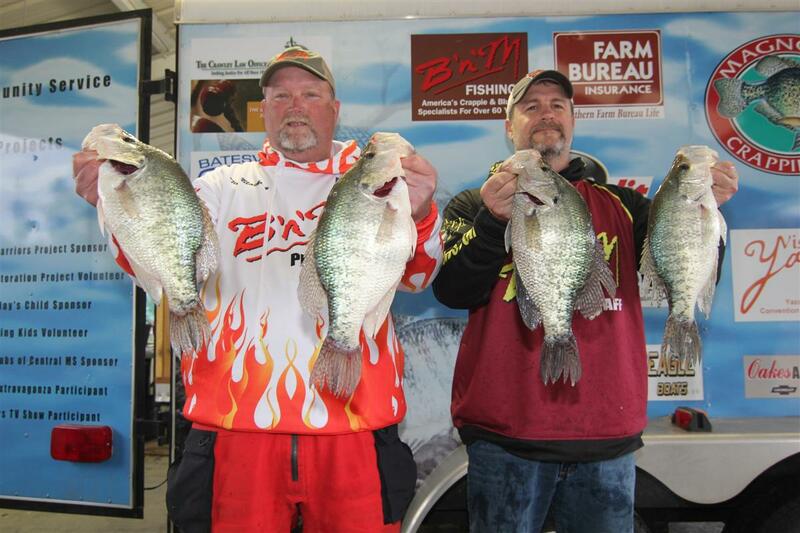 Barry Cannon & John Harrison weighed 12.47#’s to finish in the 4th slot. These guys fished 7 or 8 spots during the day, running and gunning. They slow trolled minnows with Capps & Coleman Minnow Rigs. Barry subbed for Kent Driscoll due to a work conflict. Barry is an excellent fisherman; John only needs someone in the boat so he can use 3 more poles. Congratulations to team Harrison on your Top-10 Angler of the Year finish. You were 2nd through out the year and then missed a tournament. Don’t really matter, the Championship is in your backyard. We know we’ll be fishing for 2nd place. 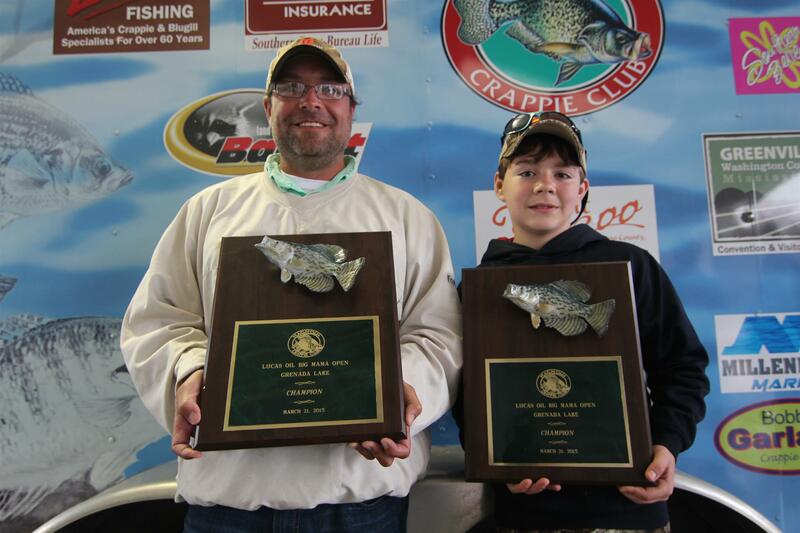 Good Luck and Good Fishing…..
Finishing out the Top-5 were Johnny Walker & William Clark with 12.41#’s. William Clark is a veteran MCC fisherman and Johnny has found an excellent partner. I look for these guys to be a force to reckon with. 1st Place Winners Pat Jeffcoats & Rabbit Rogers (13.53#’s) was no surprise to the rest of us. These guys are expected to win on Barnett. They do what it takes to win, they spend time on the water. However at Barnett, I don’t think they need any practice. Like I’ve said before, you’ll never see these guys fishing ‘community Holes’. They know the better fish are the unmolested fish. They’ll find places that others pass by. These guys are a wealth of knowledge. Rabbit knows more about jig fishing than we’ll ever imagine. I’ve heard stories about this man placing brush pile in the lake at 2am. I’m personally proud and blessed to know such good people as these two guys. Y’all keep up the good work. My goal is to be as competitive as you guys!!! 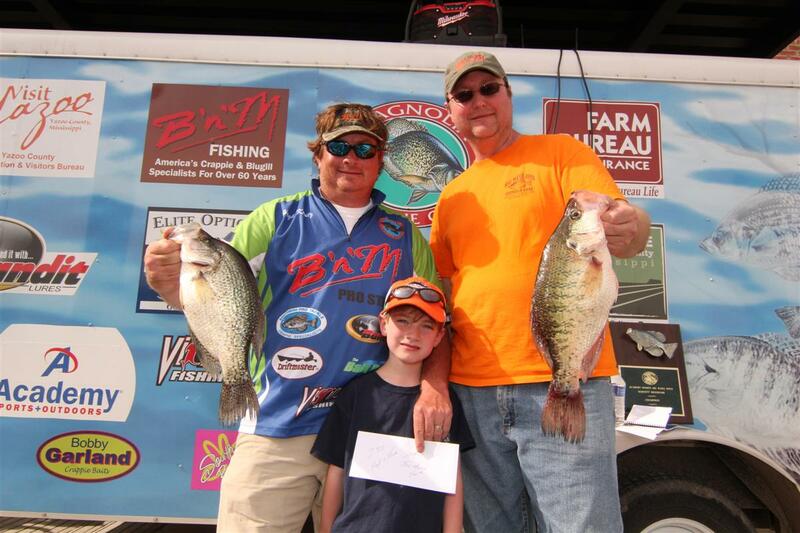 2nd Place winners Robbie Niven, David McWilliams and son Trae McWilliams (4) weighed 12.32 pounds. These guys took Long-Lining to a new height. They’re excellent fishermen and they do what it takes to win. They spend time on the water. 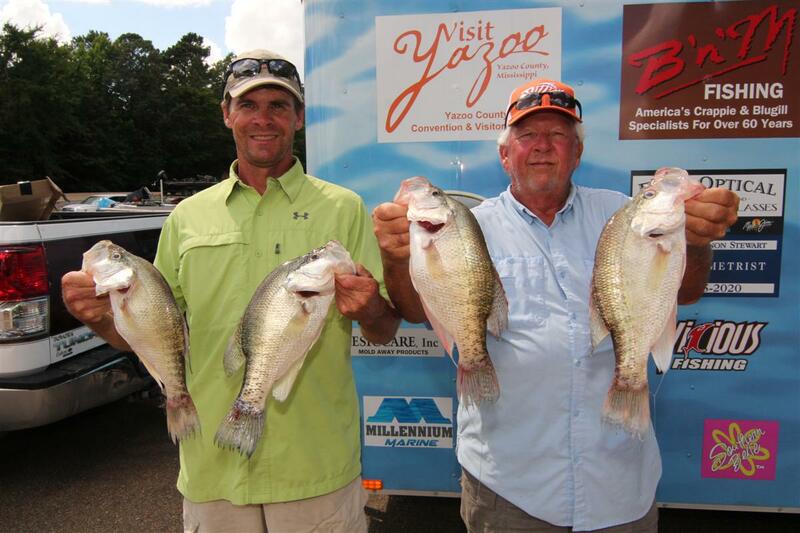 David and Robbie are one of three teams that hail from Yazoo City, MS, and I must say all three teams can hold their own fishing with MCC. These guys are no strangers to the top 10 and top 5. They consistently finish at the top of the pack in most MCC tournaments. They have the equipment and they put it to good use in every tournament. Keep up the good work guys, your day is coming. Better hurry the season is almost over……. Terry, Anna Grace, and Tonya Stewart weighed 11.86#’s to finish 3rd. They are excellent fishermen; it shows by the number or top finishes. Anna Grace is not only a good crappie fisherman; she’s also a beauty pageant contestant. I think they gave her the entire winning check for her participation. Way to go girl, you showed your big sister it pays to get up early and get on the water. Terry and Tonya are one of the several husband wife teams that compete in our club tournaments. They’ve been a fixture in a number of top finishes. Several years ago they won the Anglers of the Year Award. Dr. Tonya Stewart is also my Optometrist (Eye Doctor). If you need a good Eye Doctor, give her a call. She’s good. Terry is her assistant; be careful, that boy can sell ice to eskimoes. 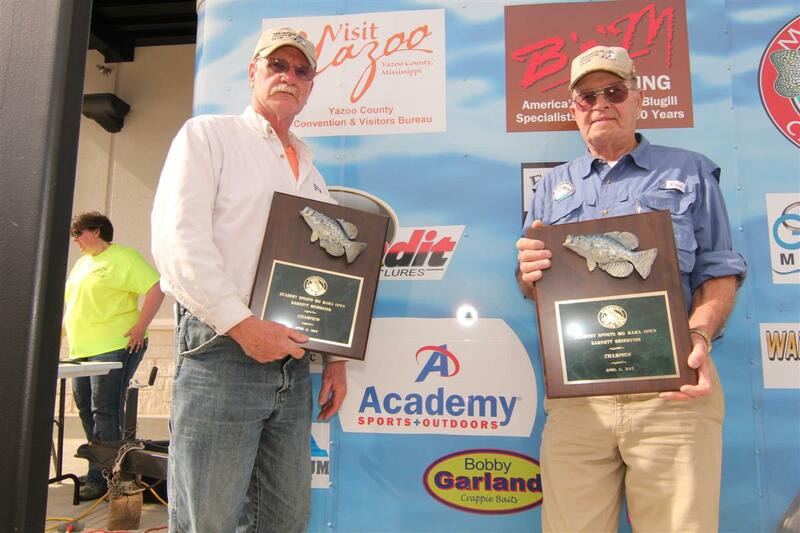 Ken Middleton (MCC President) and Larry Nipper (MCC Weigh-Master) weighed 11.66#’s to place 4th. These guys sneaked up on us with this fantastic weight. Nobody expected a team that didn’t practice one minute to do this good. Guess you can’t stop good fishermen from doing what they do. These guys are delta row-crop farmers for a living; fishing takes a back seat during the spring. The rainy weather allows them a break every now and then. 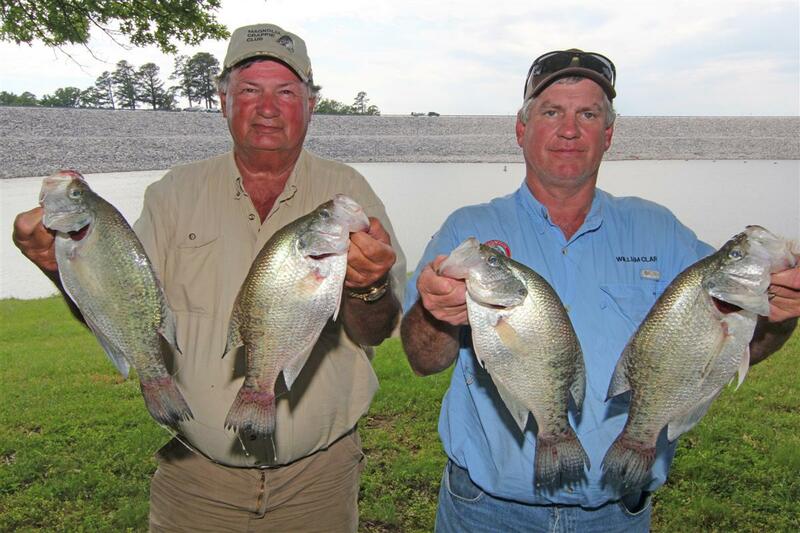 They took advantage of their day off the farm to show us how you suppose to catch crappie. Ok, enough of this guys; better get back on them tractors and get those seeds in the ground. Finally, I would like to thank Ken and Larry for their dedication to MCC. They always take out early to make sure everything is setup when we get to the weigh-in. I’m impressed by your devotion and commitment to MCC. Jerry Gross and Adam Calcote finished out the top 5 with 11.53#’s. Adam substituted for Bill Barnett, Jerry’s regular partner. It looks like Jerry is the ringer on this team. Sorry Bill, you’re just a good net man. I know Jerry was using his ‘Minnow Critters’. They work great; Y’all need to hit him up for a few dozen. Jerry and his wife hand tie each one. They’re excellent when trolling minnows. Now it’s on to Sardis; Bill, you should be very familiar with Sardis considering it’s your home lake. I’ll be looking for you on tournament day. Well guys, you’re still in the top 10 in the Angler of the Year race. Not that far from the top 5. 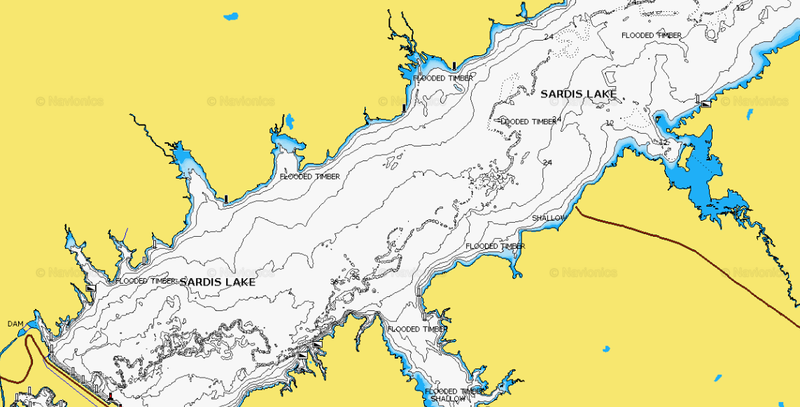 Sardis is a make-up lake. I have confidence, y’all could move up…..
1st Place Winners Hugh Krutz and Steve Stevenson weighed 18.19#’s to blow everyone else away. Hugh and Steve are no strangers to the winners circle. 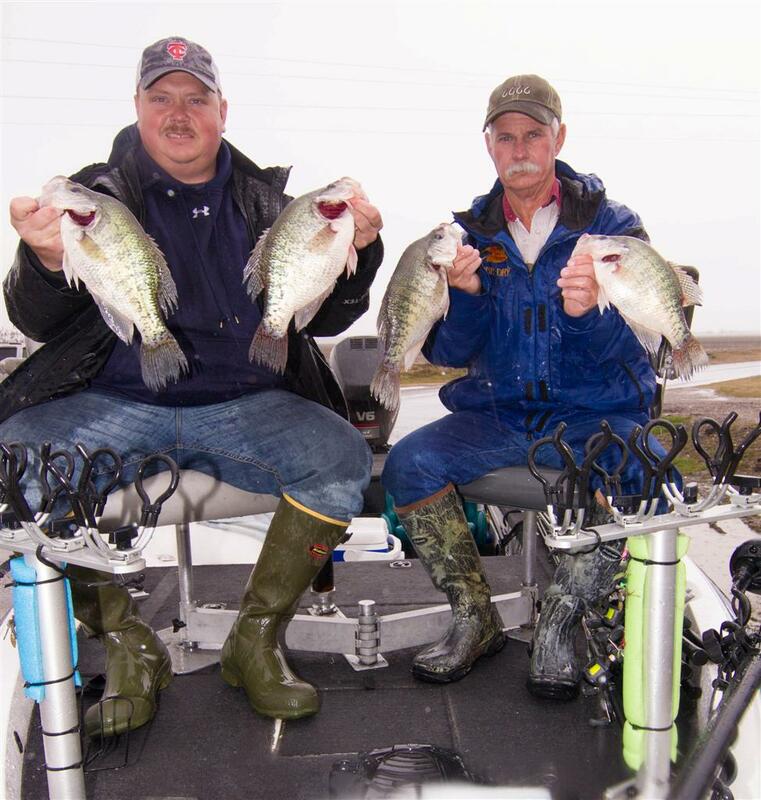 Hugh says they fished the North Greysport area with 2” tubes filled with crappie nibble and tipped with small minnows on 3/8th on jigs. Steve says he rolled several fish that would have put their weights in the 20# class. They weighed 4 fish at or better than 3#’s. I fished near these guys early morning and experienced the slow bite. They were the 1st boat to move to a more productive area before the bite stopped. Congratulations guys, ya’ll did extremely well on a day when other teams struggled. Grenada has always been good to you guys. 2nd Place winners Tim Blakley and Jack Wells weighed 17.39#’s. That’s right, no miss-print, Jack Wells B’n’M CEO and Owner actually fished with us and came in 2nd with a little help for Tim Blakley. 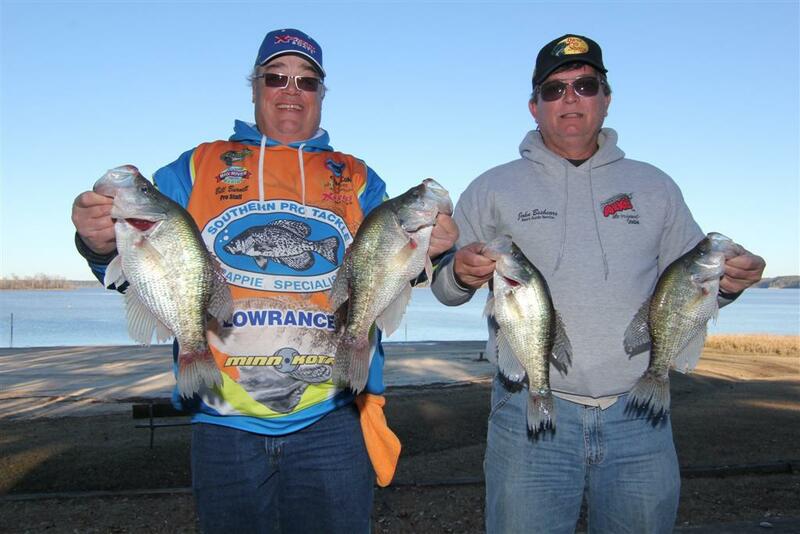 Tim says they pushed Strike King tubes on B’n’M rods in shallow water north of Greysport and caught huge crappie. They had several over 3 pounds. 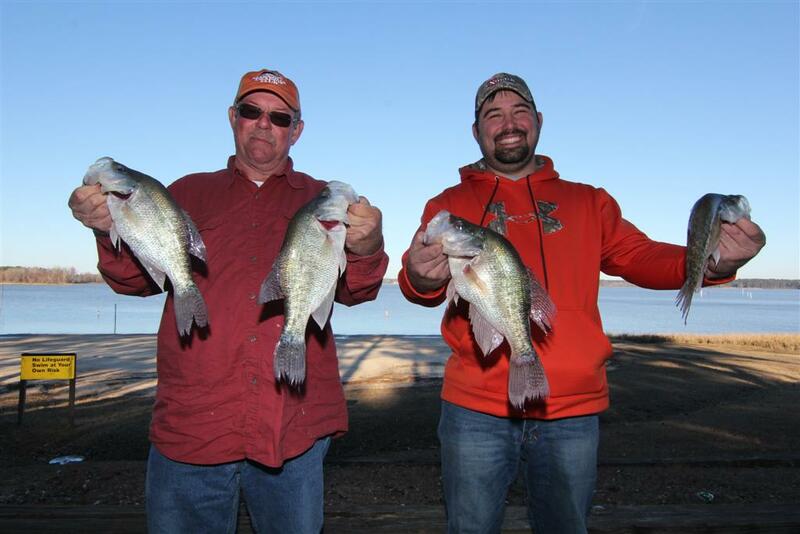 A 3.43# crappie was their big fish. Now guess what? Jack is talking about buying a boat; no Ranger for this guy, he’s going with War-Eagle. All I can say to Mike Ward at War-Eagle, you better get ready Jack’s coming your way. 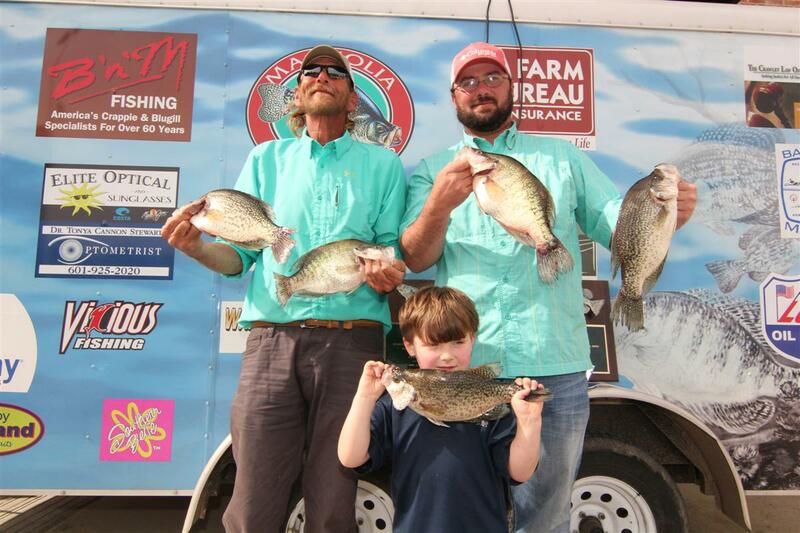 Jack says he had a blast; we know he’s hooked deeper than some of those crappie they had on the line. Way to go my friends. Good Job. Steve Marquis and Troy Garrett weighed 17.19#’s to finish 3rd. These guys are excellent fishermen; it shows by the number or top-5 finishes. 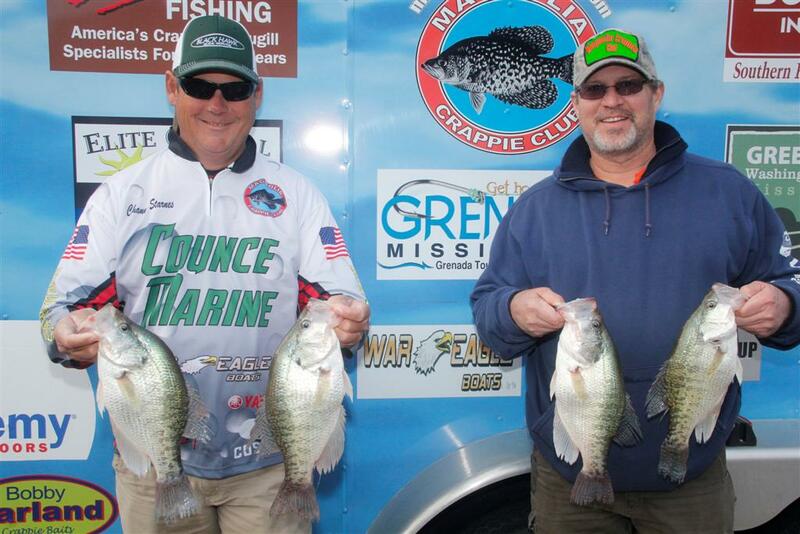 Just last week they finished 2nd in Crappie Masters at Lake Washington. They are on fire; keep up the good work guys, this is your year. I fished close to Steve and Troy for most of the morning near the Greysport road. They struggled as we did until they decided to move to the Skuna side of the lake. Good fishermen always have a backup plan when their main plan doesn’t work. They went to their backup plan and as Steve says, “We caught several 3+ pounders. As a matter of fact, they were tied for the new club record (3.51#’s)until Lance and Layne weighed their fish. 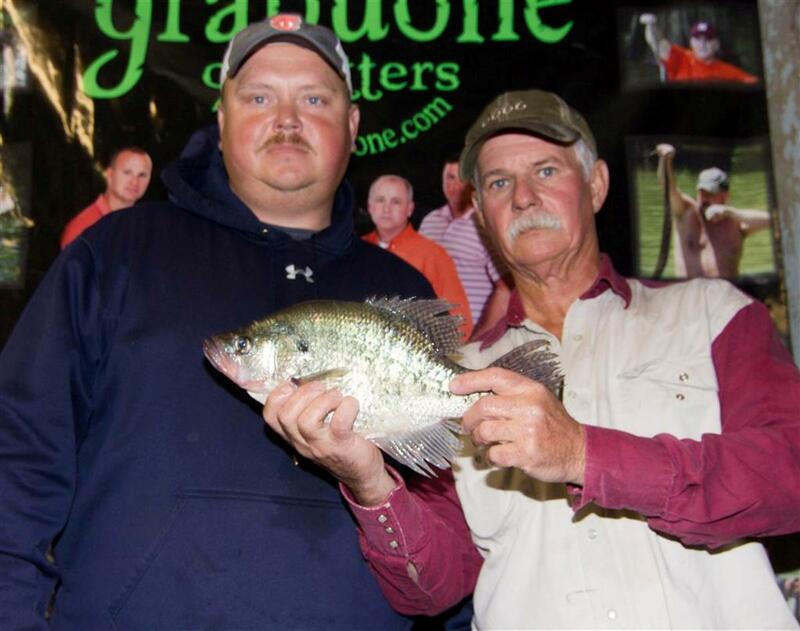 Good job guys; You got to top it off at this week’s Crappie Masters on Grenada. My money is on y’all. Jeff Riddle and Tony Hughs weighed 16.68#’s to place 4th. 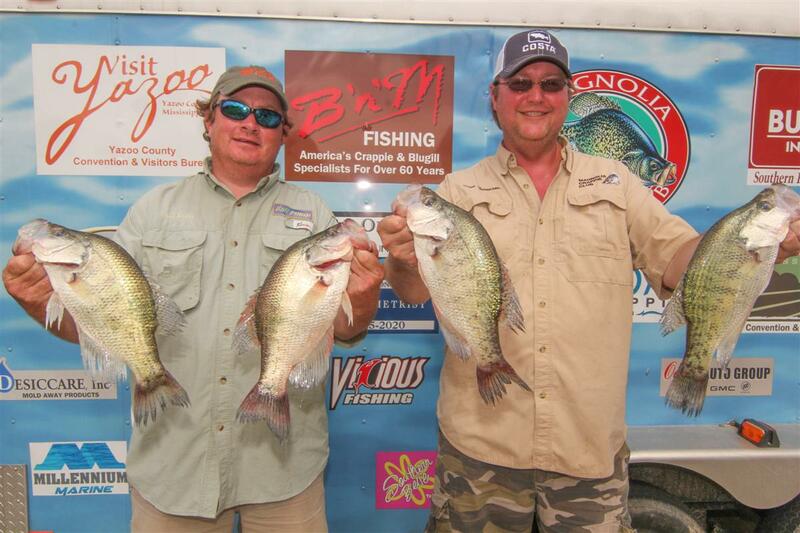 These Reelfoot, TN guys did not pre-fish one minute. I met them late Friday night at the motel. They asked if our club tournament was an open tournament because they were planning to fish the Big Mama Open. I informed them that it was and they were welcome to join us. Well you see what you can do if you know the lake. 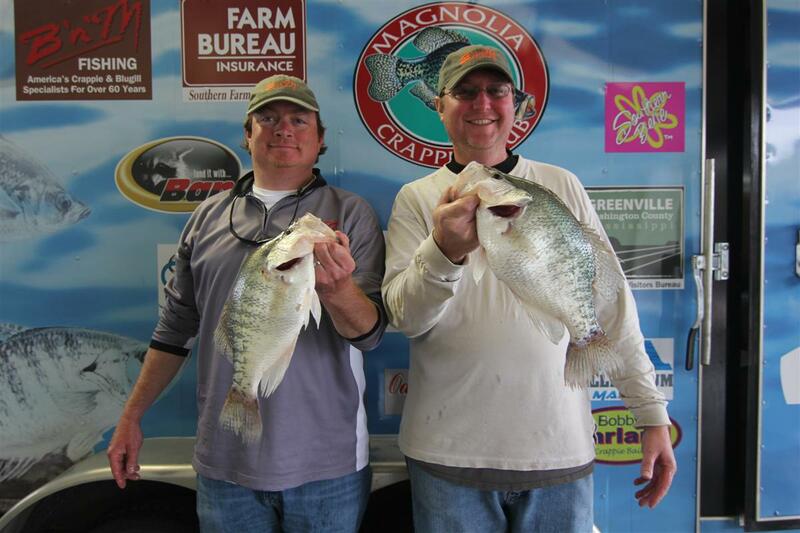 They actually came down to practice for Crappie Masters on Grenada this following weekend. Jeff and Tony are super guys; they fished the upper end of the lake, near Gums Landing. They say the fish were in 3 to 4 feet of water about 18 inches deep. They pushed jigs and minnow combinations. Jeff says they caught most of their fish early. It seems that the flood gates opened around noon and the bite stopped almost completely. You guys are great fishermen and good guys to boot. They weighed several 3+ pound fish. Danny and Ronald Wade finished out the top 5 with 16.06#’s. Their biggest fish was 2.99#’s. I saw them pre-fishing the Young’s Landing area on Friday. I knew it was big fish in the area. They did what we should’ve done early. They started the morning on the big fish. Danny says they caught over 20 fish early morning pushing minnows in 3 to 4 feet water. Congratulations Ronald and Danny. This makes two north MS lakes you’ve showed your stuff. I’ve got to figure out who’s running the show; if I ask Danny he says Ronald; if I ask Ronald he says Danny. That’s the essence of a good team. Nobody is in charge, you do what it takes to win. In this case it takes experience, patience and practice. Time on the water tops them all. Now speaking of big fish, Lance Evans and his nephew Layne Carpenter (12 years old) did what every crappie fisherman in the world could only dream of; catch a nearly 4 pound crappie. Yes, I said 4 pounds (3.92). Lance is the kind of uncle that I was blessed to grow up with. He takes his nephew fishing just like my uncles did. Layne has no idea what a feat he has accomplished. 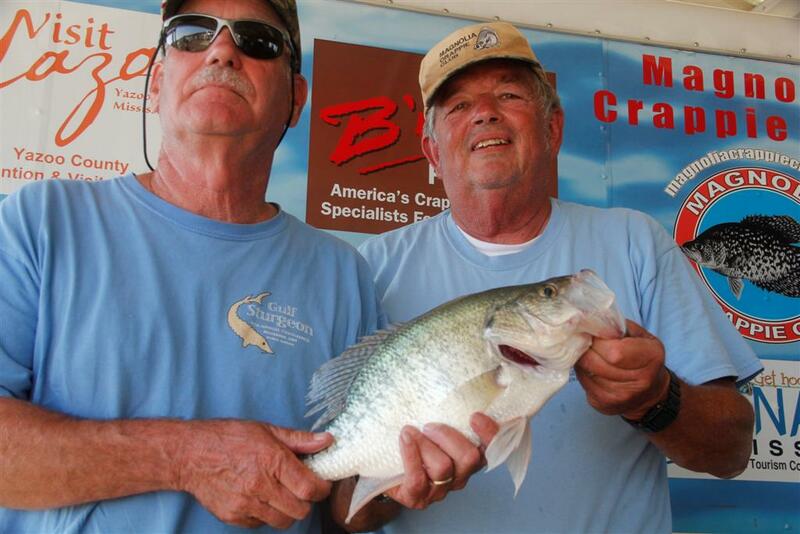 This is a one-in-a-lifetime fish, a MCC Club Record, the biggest crappie ever caught in a MS tournament. I could go on and on; I think you get my drift. I say congratulations to Layne for catching the fish and to Lance for being an angel of an uncle. Lance, you are an asset to MCC; we need more men like yourself. 1st Place Winners William Tyer and Richard Sanders drug 10.51#’s to the scales to win at Washington. These guys just did not quit. They threw everything they had at those lazy fish. They were one of two teams to catch 7 fish. They proved what I said at the beginning of the day, “If you catch 7 fish you’re going to finish in 1st or 2nd. If I’m not mistaken, this is William & Richard’s 1st MCC win. Congratulations my friends, it was well deserved. If you could go out in 35mph winds and rain; fish all day, land every fish that bites your hook, you deserve this win. Way to go guys, way to go. I also see you guys moved up to the top-10 in the Angler of the Year Race. That’s a good thing. Clint Egbert & Jeremy Aldridge weighed 9.86#’s to finish 2nd. This extremely high weight pushed them to 1st Place in the Angler of the Year Race. Congratulations guys, it’s hard to stop a train coming down the tracks full speed; you better not get on the tracks. These boys are hot; I heard someone saying, “These guys could catch fish in a bath tub”. Who needs practice when you’re that L-U-C-K-Y. That’s right I said lucky, I’d rather be lucky any day than good. I think they have a big helping of both. I fished next to them for a while; no need of making my luck any worse, so I moved. On to Grenada, maybe we can put a handle on y’all up there; who knows, that’s where y’all started the streak. 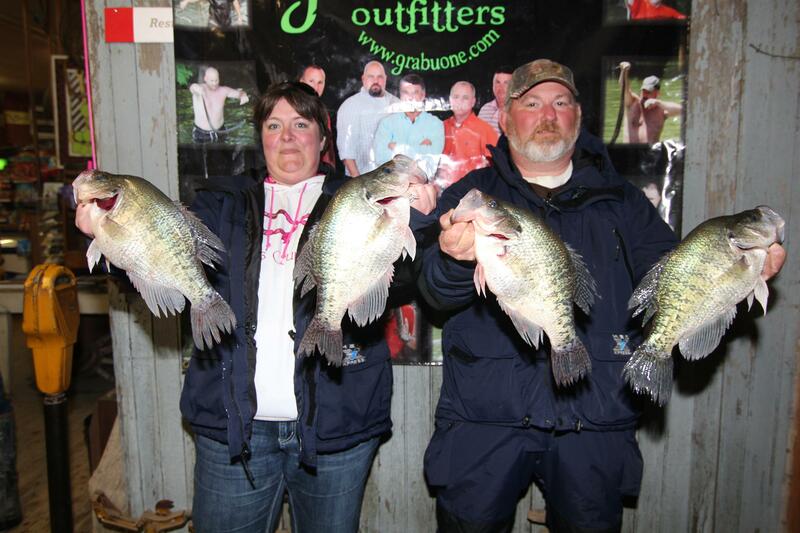 Paula & Michael Nowell continued to do well on their favorite lake; weighing in 9.03#’s to finish 3rd. They had their 7th fish on the hook that was well over 2#’s. Sorry guys, it’s called fishing not catching. Y’all are extremely lucky on Washington; I thought you spent your honeymoon on Arkabutla. Seems like y’all have a honeymoon on Washington almost every year catching fish. They had a 2.96# slab for their kicker. I don’t know about you; that’s 3 pounds in my book all day long. Larry Holmes and his partner T.J. Ferguson finished 4th with 7.90#’s. They only caught 5 fish all day long; what do I mean only 5? That was an excellent catch seeing how we had 36 teams and only caught 56 fish. Wish I had caught 5, 4, 3, or 2 for that matter. Larry and TJ are setting the woods on fire this year. Some call it beginners luck; not sure what to call it. I just wish I had some of whatever it is. They’re really doing good. If I’m not mistaken, they just maybe in the lead for the Rookie of the Year Team. I can’t say Larry & TJ had an advantage for the practice; Larry says he’d been at Washington for 4 days; only got to fish one afternoon. Weather was horrible; snow, ice, rain, and wind. They’ve seen it all; oh did I mention it’s one of the worst winters on record and these guys are trying to fish. Just don’t make no sense. Put them rods up till it warms up, please. 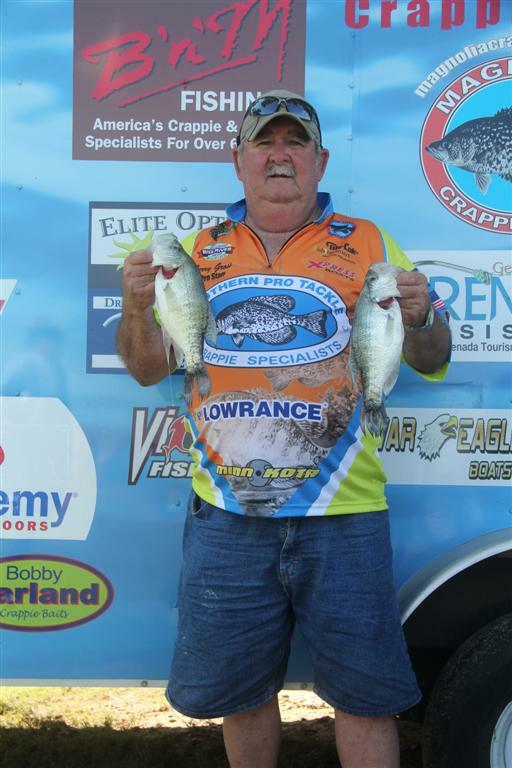 John Harrison fished alone and weighed 7.54#’s with 6 fish to finish out the top 5. John is another one of those guys that can catch fish when they’re not biting. He makes the necessary adjustments to put his bait just where the fish are. I can’t argue with success. Harrison has a knack of knowing when and where to make adjustments. He comes to the lake with a solid game plan and makes adjustments quickly. His many years of experience makes him know what will or will not work. If he thinks fish are going to turn on in an area he will work it with a vengeance. If not he’ll move quicker than a renter with overdue rent. Way to go John; I study people with a talent or a gift. You have the gift. You also have favor. You can’t beat favor. 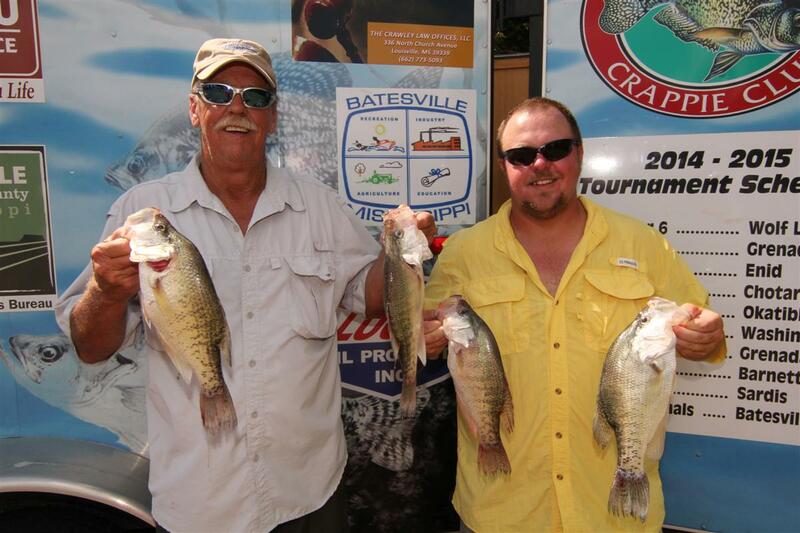 1st Place Winners Bill Burnett & John Beshears carried 8.97#’s to the scales to win Okatibbee. It seems they pre-fished the lake on Friday and found several brush piles on a creek ledge that held good fish. These guys had the fish dialed in as far as depth and trolling speed. With the help of a former MCC member and local crappie guide Scotty Vance, this team was able to pull off their 1st win since joining MCC. Pat Jeffcoats (right) pulled a switch on us at Okatibbee. His normal partner Rabbit Rogers couldn’t make the tournament. 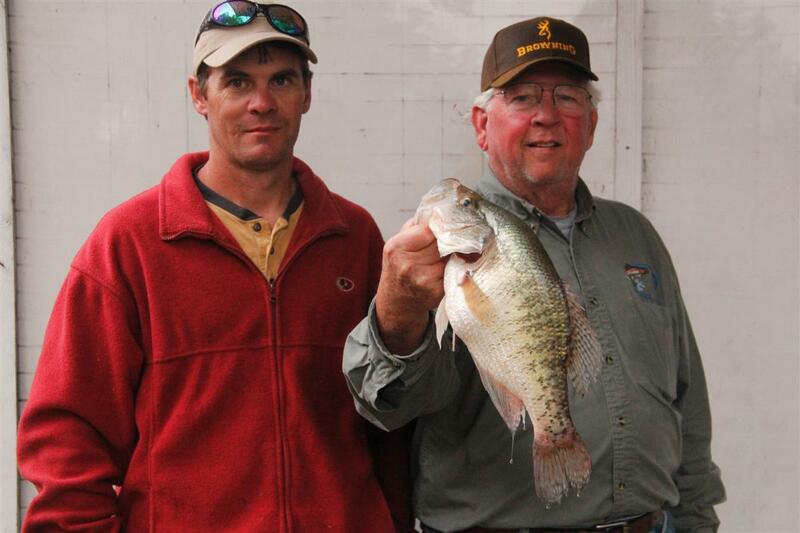 Pat fished with a guest; Miller Reid and caught 8.83#’s to finish in 2nd place. These guys fished in a large group of boats and did excellent. It goes to show us that Pat can fish with or without Rabbit. Guess I learn something new everyday. When you got it, you got it; these guys did good. It’s no need trying to interview Pat; he as tight-lipped as a crook in a police interview room. He will not tell you a thing. All I know is they caught their fish slow trolling minnows. No jigs this time, as far as I could tell. On another note, Pat gets irate when you get too close; even to the point of yelling and screaming. Oh well!!!!! Larry Holmes & TJ Ferguson finished 3rd with 8.74#’s. As far as I could tell they fished the area around the marina. This rookie team is pretty hot; they won Grenada and now a top 5 finish at Okatibbee. Way to go guys. Larry fishes a lot. You can look for him to hit it hard and heavy at Lake Washington. He’s an excellent jig fisherman. He’s getting better at reading the electronics. It’s no telling what he’s going to pull out of his bag of tricks at Washington. TJ on the other hand is my kind of guy. All I have to do is get him away from Larry and he’s going to spill the beans. He’ll tell you everything from the minnow size to the jig size to the exact location. It’s going to be trouble when Larry finds out. Please don’t tell Larry. Vic Finkley & Kim Gray finished in the 4th slot with 7.90#’s. This team continues to do well regardless of the lake and fish situation. 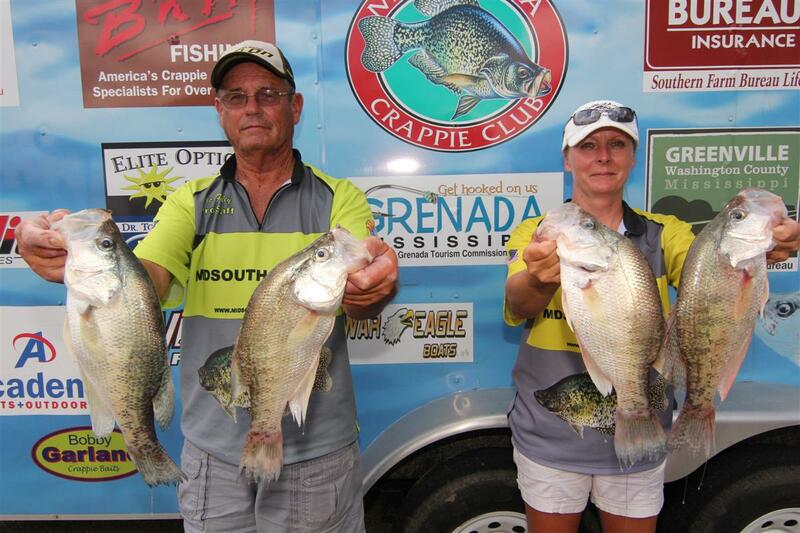 Vic & Kim are crappie guides on all the North MS Corp Lakes. They spend 200+ days a year on the water and it shows at the scales. Uncle Vic and Kim (Super-Chicken) are nice people. They’ve never met a stranger. 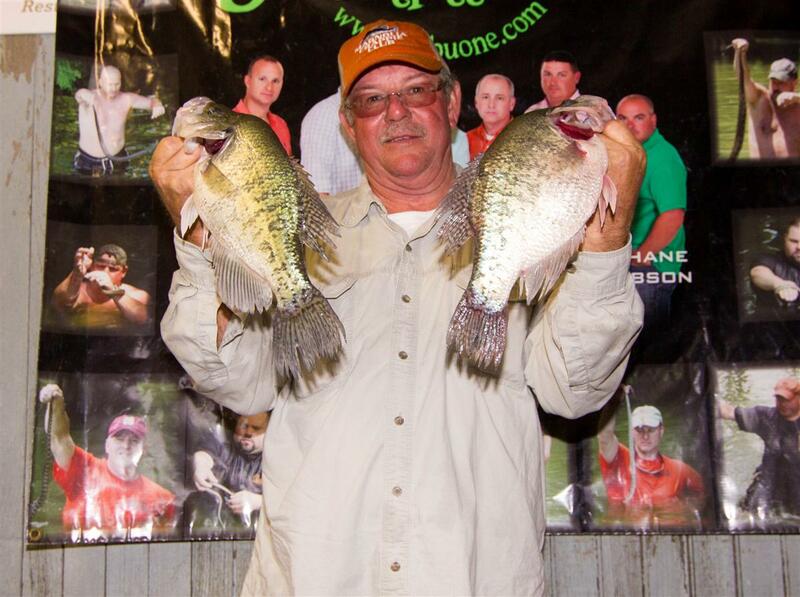 If you have a question about crappie fishing, just ask them. They’re straight shooters; they will not feed you the B.S. that other fishermen will. 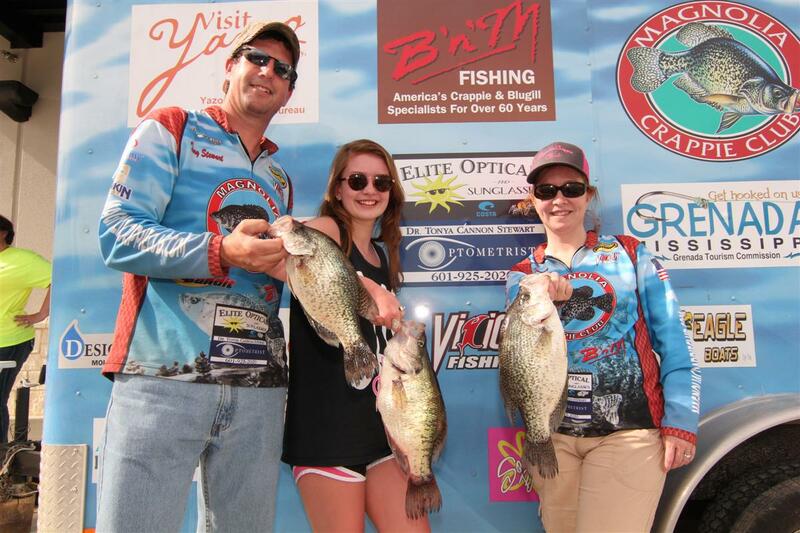 Vic & Kim are sponsored by Midsouth Tackle. They’re different from other sponsored teams; they actually use the products their sponsors sell. Team Gray as we refer to them as, work like a well oiled machine. They don’t have to talk to each other; when one gets a fish on the line the other grabs the net. Couldn’t ask for anything else. We’re proud to have them as MCC Members. Charles Lindsay & Graham Taylor weighed 7.72#’s to finish 5th. 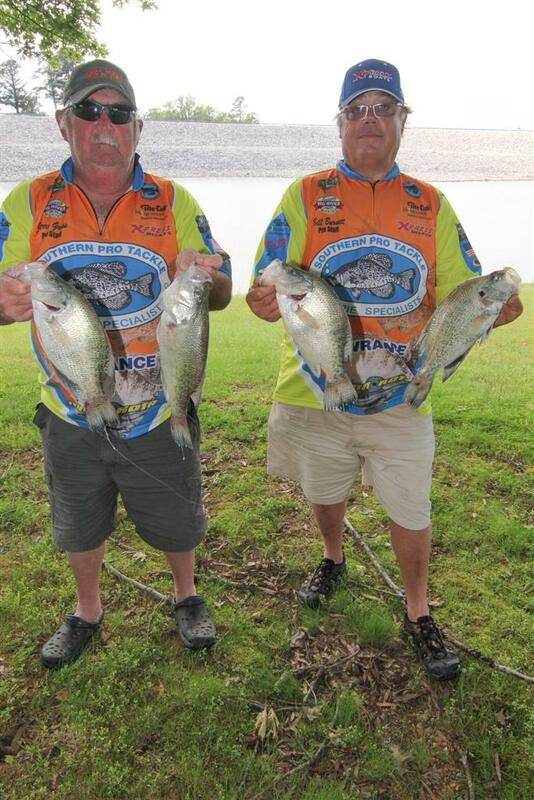 Charles & Graham fished several practice days as you can tell from their finish. They consistently finish in the top spots. Charles Sr. & Graham are leading in the Angler of the Year Points race at present; y’all know how that can change; but his favorite lakes are coming up. You can bet your last dollar the ‘ole-man’ will be out on the lakes getting ready to lay-the-wood to some crappie. These guys fished the mouth of Long Branch most of the day and did quite well. Knowing Charles, he probably found his fish on a weekday. At the rate Charles & Graham are rolling Charles, Jr. is F-I-R-E-D as far as I can tell. I tell you what, “I personally wouldn’t change what’s working.” At least Graham can get to the lake on time, LOL. Y’all done good. Consistency is the name of the game when it comes to tournament fishing; y’all proving that to be true. 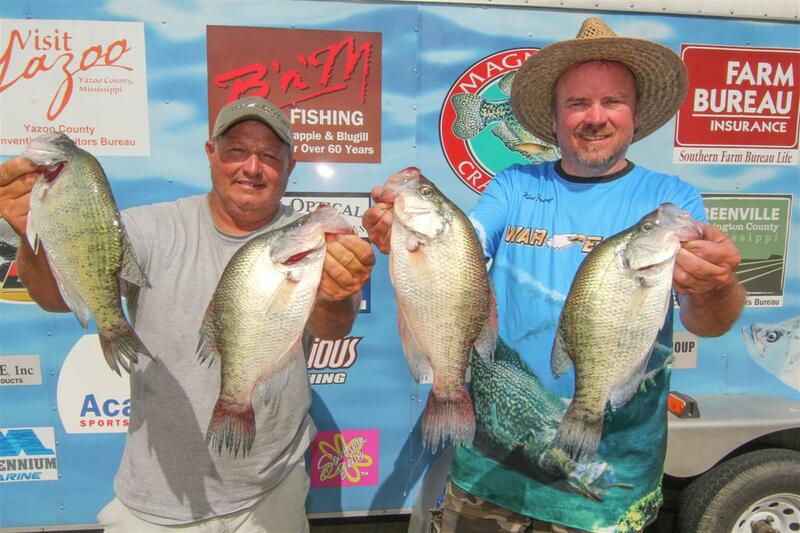 1st Place Winners Jimmy and Ricky Smith(13.44#’s) did something most of us Eagle Lake fishermen failed to do, they slow-trolled the brush-piles and open water between the piers. 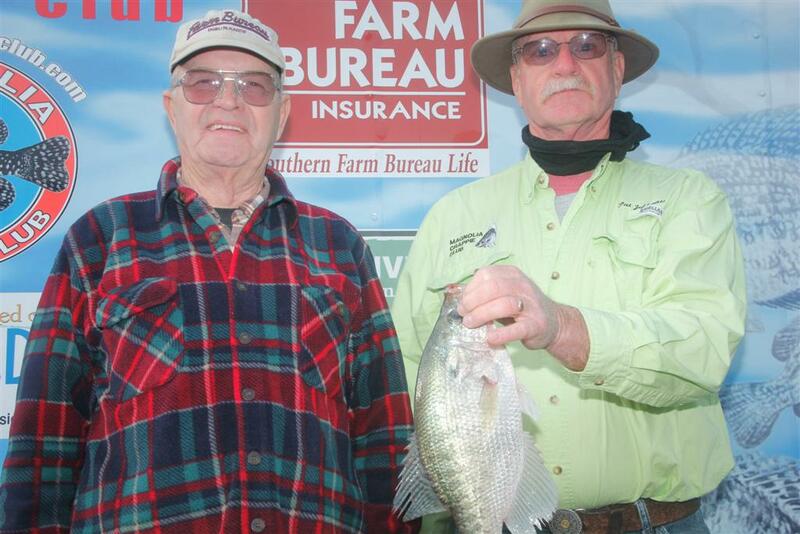 They caught the big white crappie that won the tournament. I knew the piers could produce winners, it was a matter of finding the hot piers. At Eagle the piers get pounded. During the winter months it’s constant fishing. 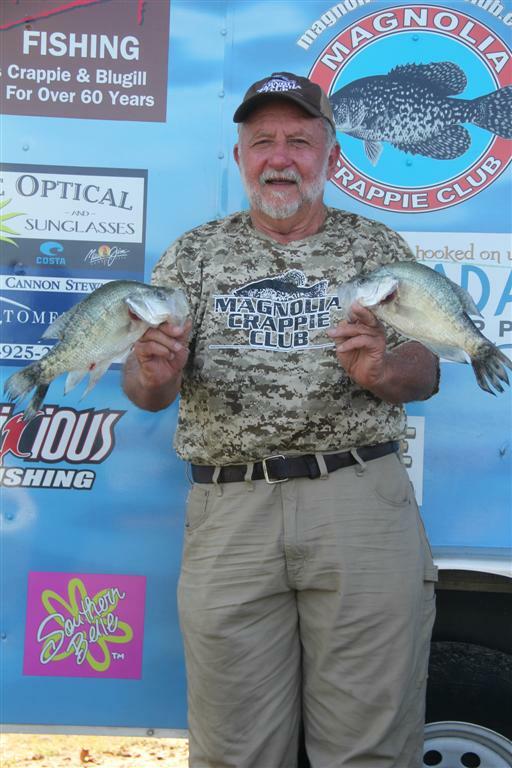 Ricky says, “We found schools of shad with our electronics and several times we caught crappie on the bottom hook and hooked shad on the top hook.” These veteran MCC members know what it takes to win and they did just that. I didn't know when I took their photo it would be the championship picture. I had heard they had a big stringer, as it turned out they had the .2 of a pound needed to win. Congratulations guys, great showing. 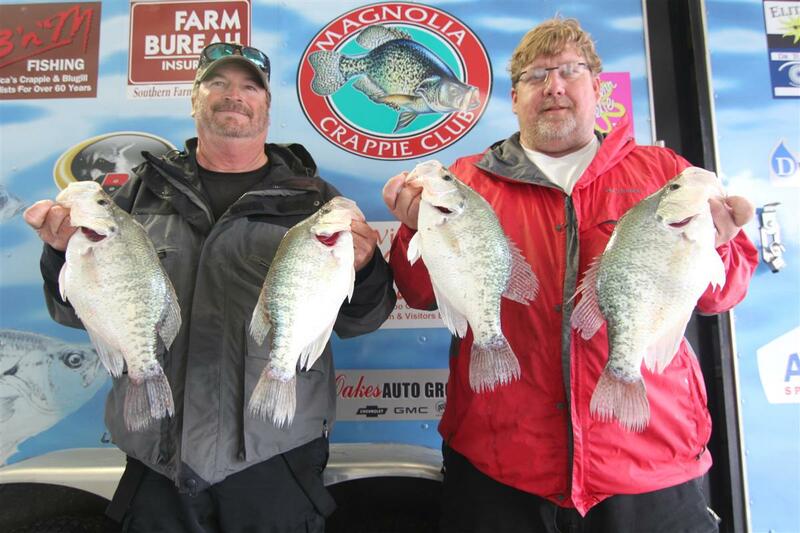 Shelton Culpepper and David Thornton weighed 13.24#’s of Eagle Lake crappie to capture 2nd place. These guys live on Eagle; everyone expected them to win. They have several times. Shelton says, “Don’t let that black bucket fool you”. He’s right, that ole slick rascal. He was telling us on Friday that the better fish were on the north end of Albermarle. I paid no attention to his antics; been there, done that. David is totally different. He won’t tell you anything. His response is “I ain’t catching no quality fish”. The reason is when he gets one on the line during practice he shakes it off. I’ve seen David and Shelton have up to four fish on their poles at one time and not even pick them up while someone was passing by. Now that SLICK…. Rabbit Rogers and Pat Jeffcoats weighed 13.15#’s to fall in the 3rd place slot. 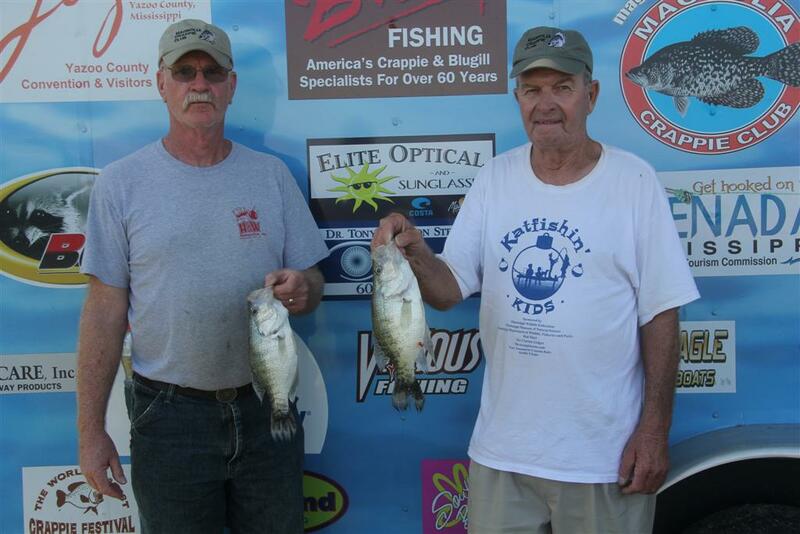 They too fished the Eagle Lake piers. The thing about them as always is they fished other structure too. You’ll never see these guys fishing the Community Holes. They know the better fish are the unmolested ones. They’ll find places that we pass by and put a jig in there and bam. These guys are a wealth of knowledge. Rabbit knows more about jig fishing that we’ll ever imagine. I’ve head stories about this man placing brush pile in the lake at 2am. Talk about making your own honey holes. I’ve also been told that once he even ran his boat in a willow top to run the fish out and then started picking them off one by one. Now that’s amazing. I’m personally proud and blessed to know such good people as these two guys. 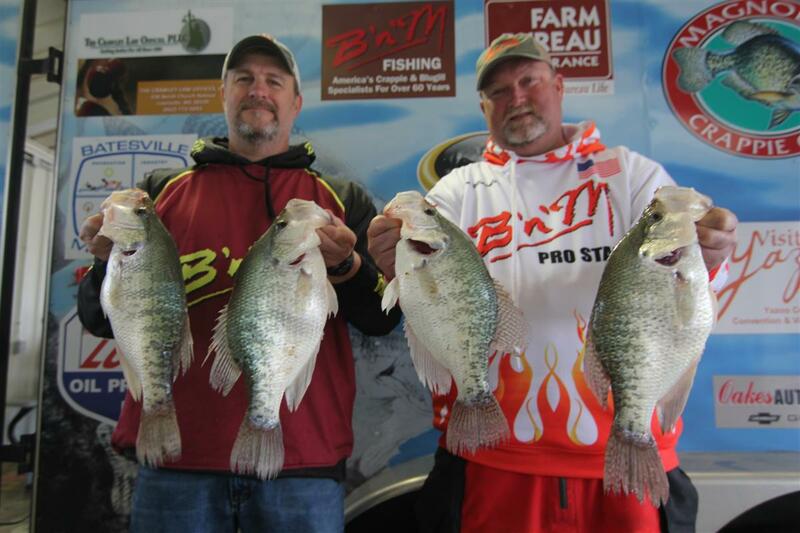 4th Place winners Keith Sullivan and Monty Blount weighed 12.98#’s. I watched these guys fish a big brush top all day. I’ve fished the same place several times with very little luck. The tree top they fished was so big over half of it was out of the water in 12 feet of water. It was lots of work to fish this type of structure; you stay hung constantly. Monty and Keith didn't mind; they were patient and persistent. That’s what it takes to be in the top 5 with MCC. On another note, I must tell you about the character of these guys. They are superb men that’s been a part of MCC for a long time. Both guys have included their children in their fishing and hunting activities. That’s impressive; that’s what good fathers are suppose to do. Monty loves to joke around; Keith is a more serious guy. 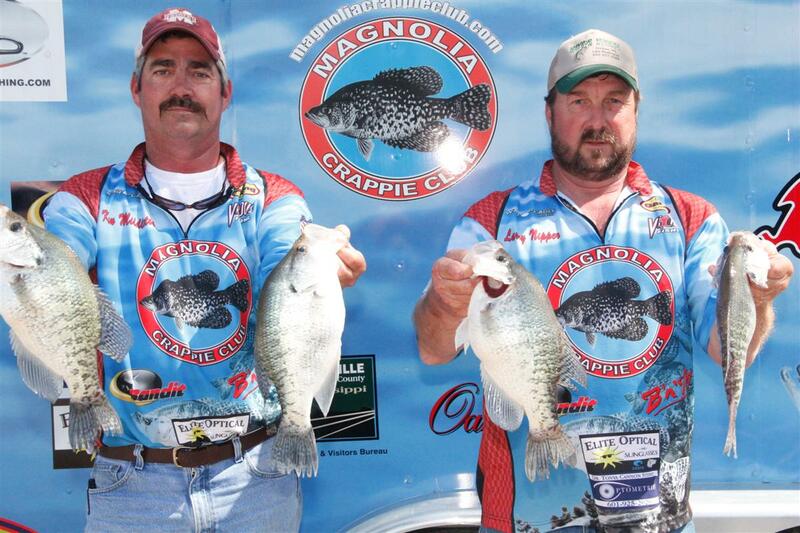 One thing they both have in common, they love crappie fishing and they love MCC. That’s fine in my book, because we love and enjoy Keith and Monty. Way to go guys, y’all did good. Kim Gray and Vic Finkley weighed 12.89#’s to finish 5th. Aunt Kim and her ‘Net Man Vic’ fished the upper end of Albermarle and did the best in that group. 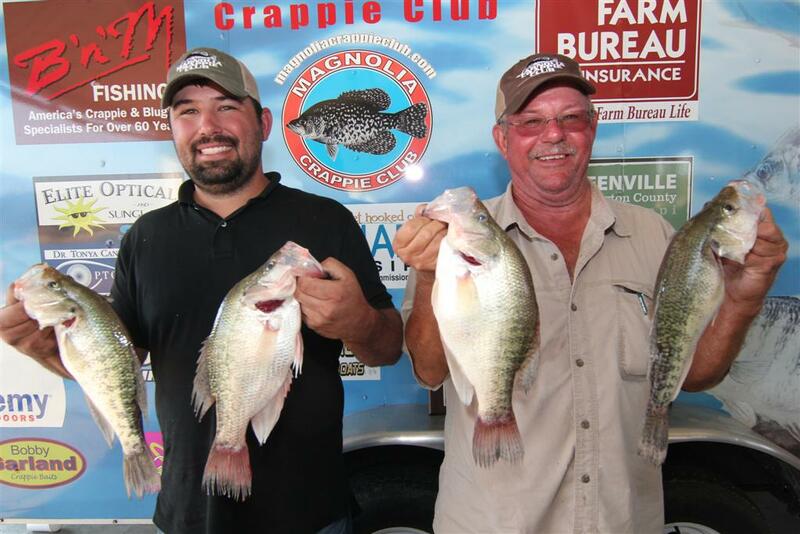 They caught a bunch of fish but the black crappie couldn't match the white crappie in Eagle Lake. Vic and Kim are from Grenada and they run Vic’s Guide Service. They guide fish for a living; that’s got to be fun. Vic traded his 22’ Ranger for a pontoon boat that was more stable and economical. I didn't understand at the time but now I see why. 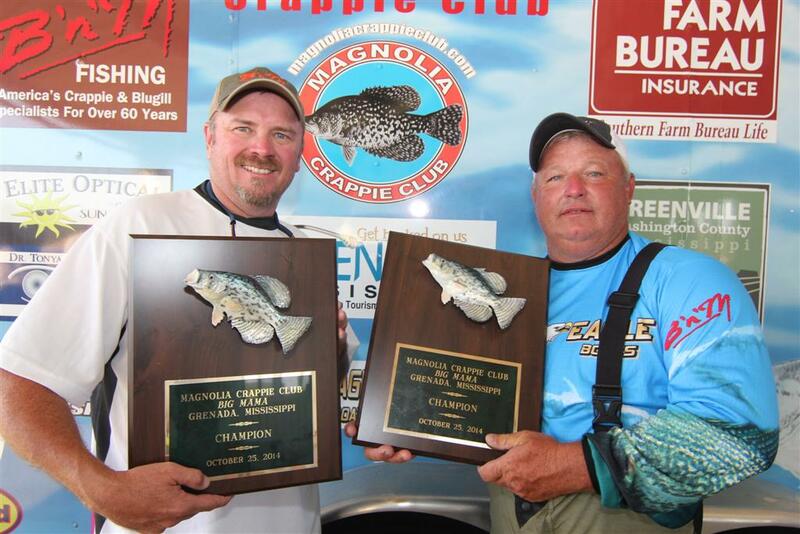 Chaney Starnes and Glenn Frazier blew us away with a huge 13.50# stringer to win the MCC Enid Lake Tournament. These guys fished the Water Valley area of the lake from early morning to stop-fishing time. Chaney says they caught good fish nearly all morning pushing minnows in 12’-14’ water. They realized the cold front had put the fish deeper in the water column. They put their minnows almost on the bottom and moved about .2-.3 mph. 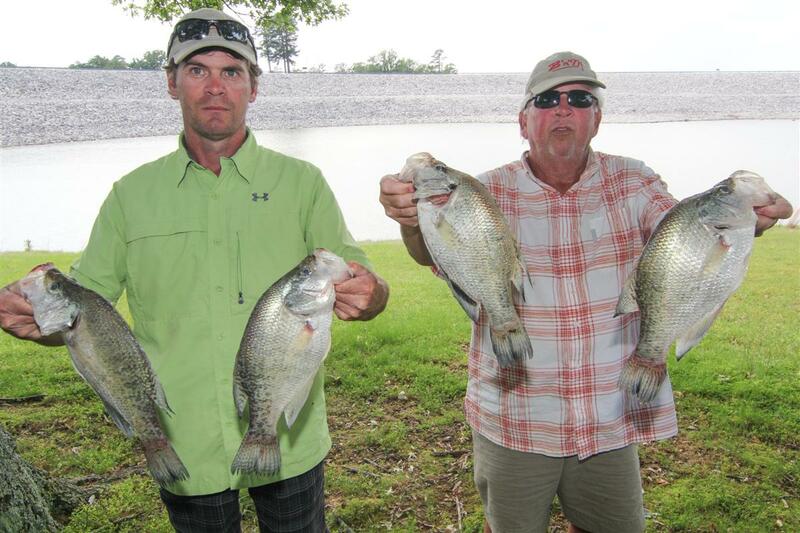 Chaney and Glenn says, “The bite was very soft; you had to watch your pole tip and your line. Sometimes they would take it and lift up the pole; you had to set the hook quickly or they would spit it out.” Chaney is no stranger to winning; he and his partner won the first day of our Sardis/Enid Championship Tournament back in June. My question now is, can they continue this winning when we move to the River Lakes, only time will tell. Congratulations and good luck guys on a job well done. I don’t know about you, but I think they just might have unlocked the secret to catching fish. This is their 2nd tournament to finish in the 2nd place spot. These guys are a class act, they know the how, when, and where of crappie fishing; on top of that, they’re some pretty good guys. Good Luck. Tympel Turner & John Harrison finished in 3rd place with 11.86#’s. They’re very familiar with Enid, John guides on this lake weekly. 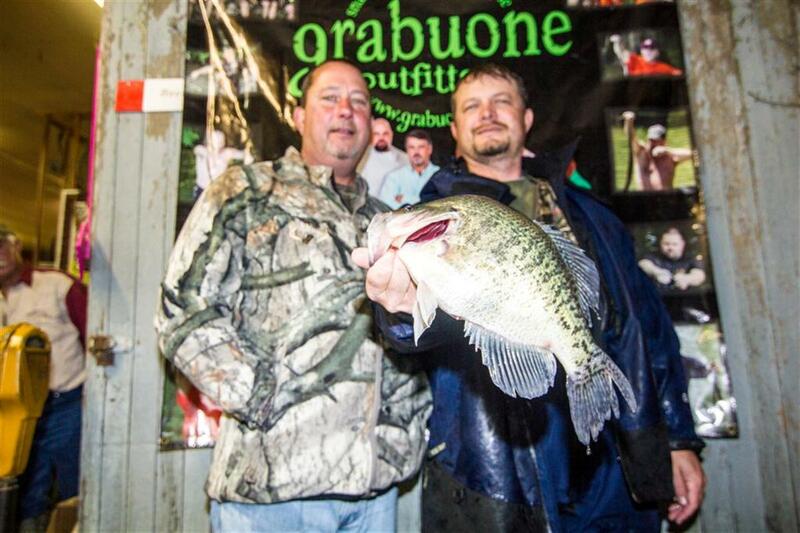 Last week they had the winning stringer in the Crappie.com Fruitjar Tournament with about the same weight. John’s technique is simple, put a minnow in front of them and they’ll hit it. John & Tympel is hard to beat on any lake, especially on any of the Corp Lakes. We’re moving south John, better have your hooks sharp, we’re gonna give you a run for your money down south my little buddy. Good job and see you at Eagle. Charles Lindsay & Graham Taylor weighed 10.76#’s to finish 4th at Enid. 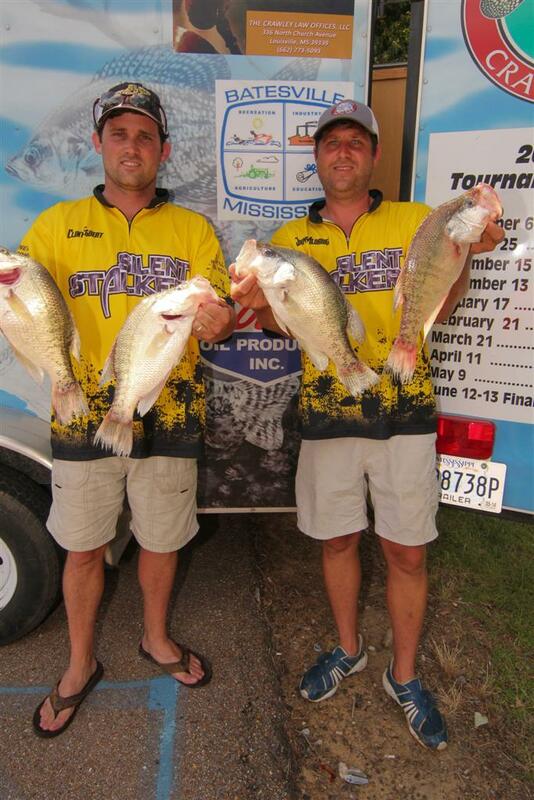 Charles & Graham are very familiar with this North MS Lake; they consistently finish in the top spots. Charles Sr. & company are leading in the Angler of the Year Points race at present; y’all know how that can change; but his favorite lakes are coming up. You can bet your last dollar the ‘ole-man’ will be out on the lakes getting ready to lay-the -wood to some crappie. These guys fished the mouth of Long Branch most of the day and did quite well. Knowing Charles, he probably found his fish on a weekday. At the rate Charles & Graham are rolling it’s gonna be hard for Charles, Jr. to get back in the boat. I tell you what, “I personally wouldn’t change what’s working .” At least Graham can get to the lake on time, LOL. Y’all done good. Consistency is the name of the game when it comes to tournament fishing; y’all proving that to be true. Rounding out the Top-5 were the Wade Boys, Ronald & Danny Wade with 10.46#’s. They were another team that fished the Wallace Creek Mouth with success. Ronald is a regular, Coach Danny is returning after a long hiatus coaching high school basketball. I don’t think these guys practiced a lick. They put the boat in and trolled out to the mouth of the creek, dropped the poles in and started raking in the fish. The story I heard, they caught a limit by 10am. I know guys that followed directly behind them to no avail. 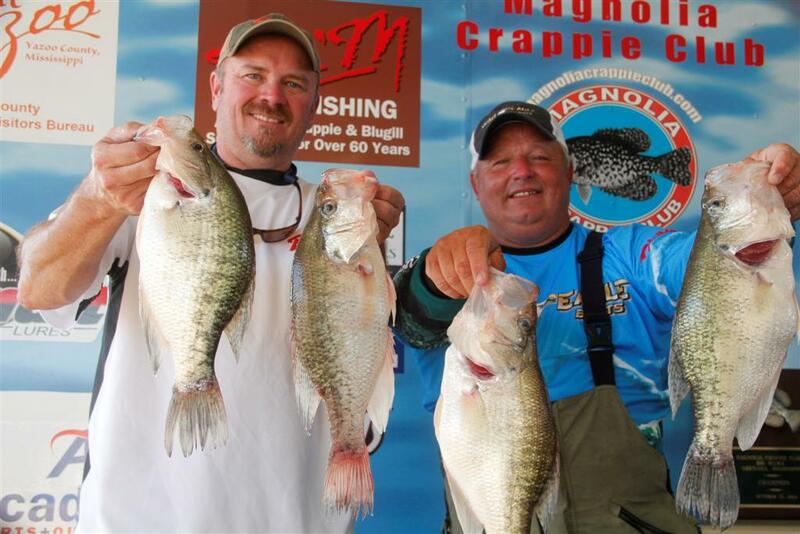 TJ Ferguson & Larry Holmes weighed 7 fish for a total weight of 16.55#’s to win Grenada Lake Tournament. 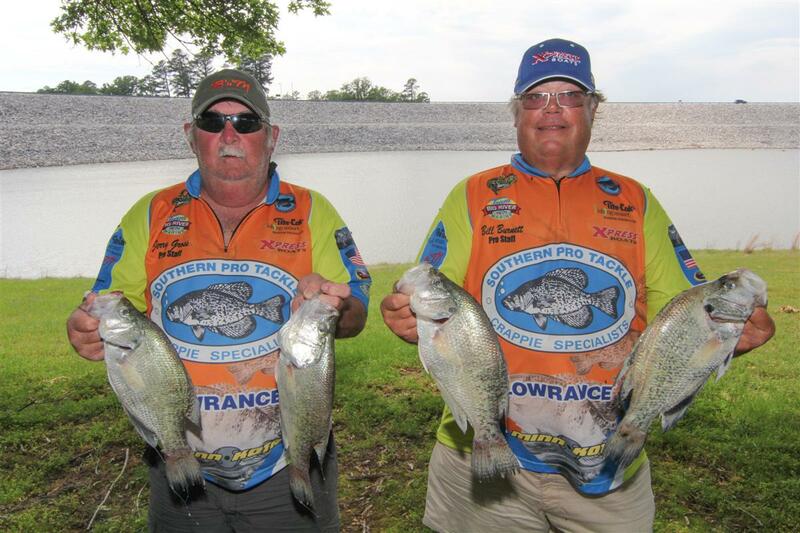 This is Larry & TJ’s first year as a team, Larry fished as a guest of Terry Stewart a few times. Good job my friends, y’all showed us how it’s done. Keep it up…. 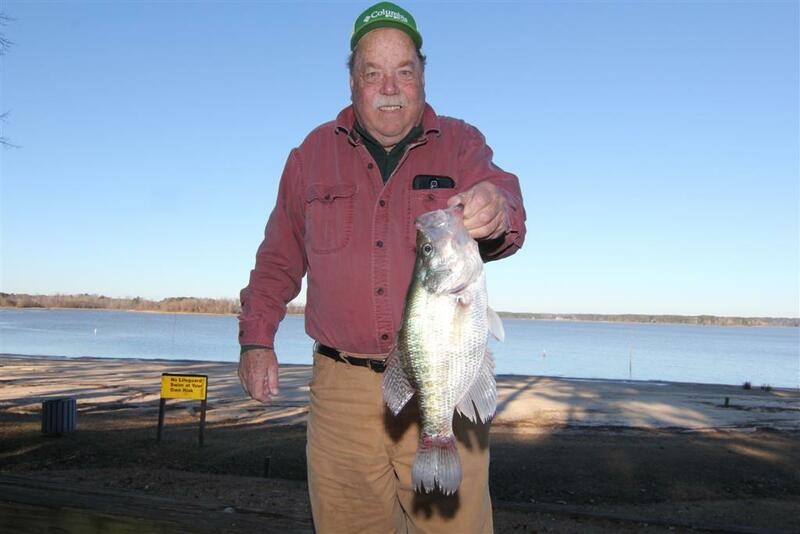 Grenada Lake is an awesome lake, no other crappie lake in the country can and do produce the monster crappie like this lake. Larry Holmes and TJ Ferguson proved that on Saturday. 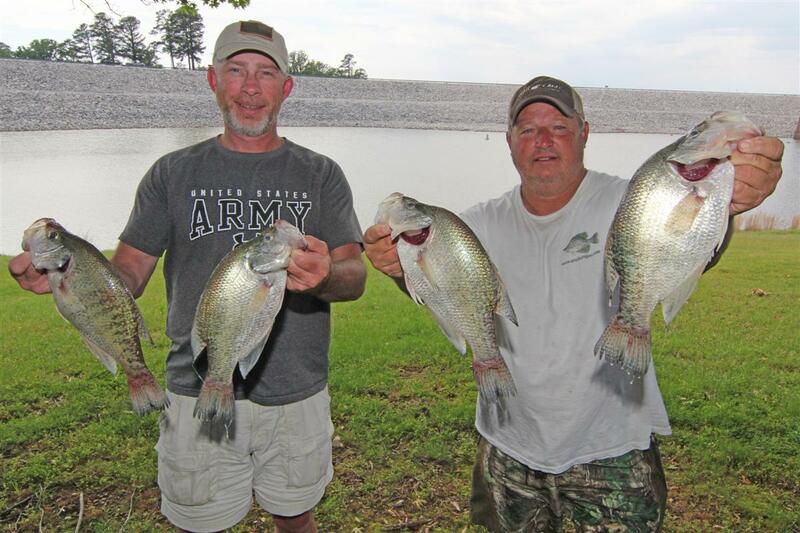 They fished the mouth of Perry Creek and boy did they lay the wood to the crappie. 16.55#’s of crappie would be an excellent weight for the spawn; no where but Grenada would you expect this weight in the Fall. 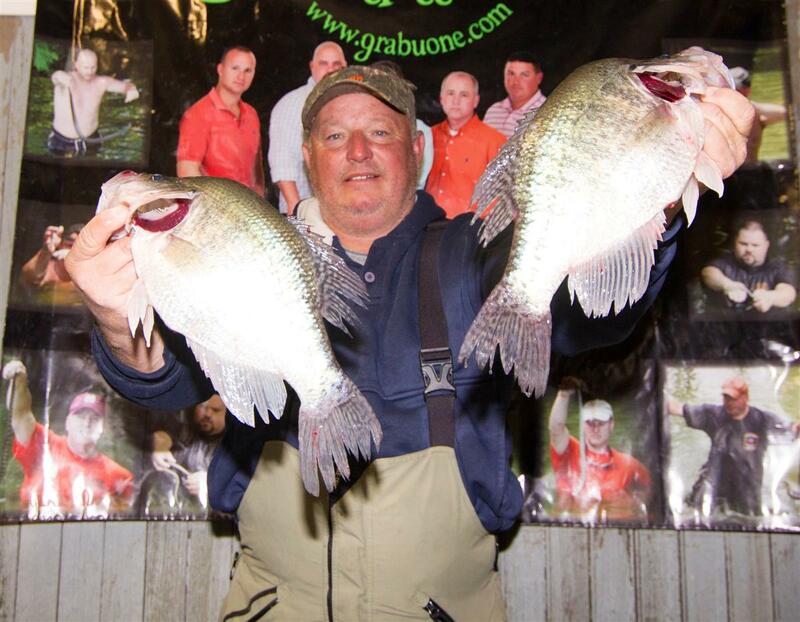 Larry says they pushed minnows almost on the bottom to catch about 20 or more slabs in the early morning bite. These guys had no problem catching their 7 fish limit while others struggled. TJ says, “we had our limit around 8:30am. We had our weigh-in fish around 9:30, then they shut off. You have to catch them while they’re biting or you’re out of luck”. So true my friend, so true. 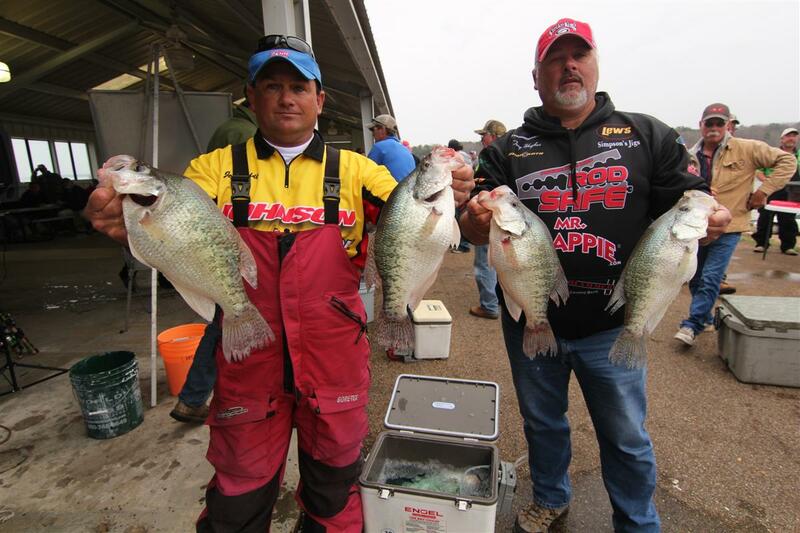 Bobby Garland & Bass Pro Staff Team Brad Chappell & Bo Hudson finished 2nd with 15.09#’s. These guys fished the Carver Point area, long-lining soft plastics. Brad says, “We found those fish about a week ago; we pulled off them rather quickly and continued to check them during practice. 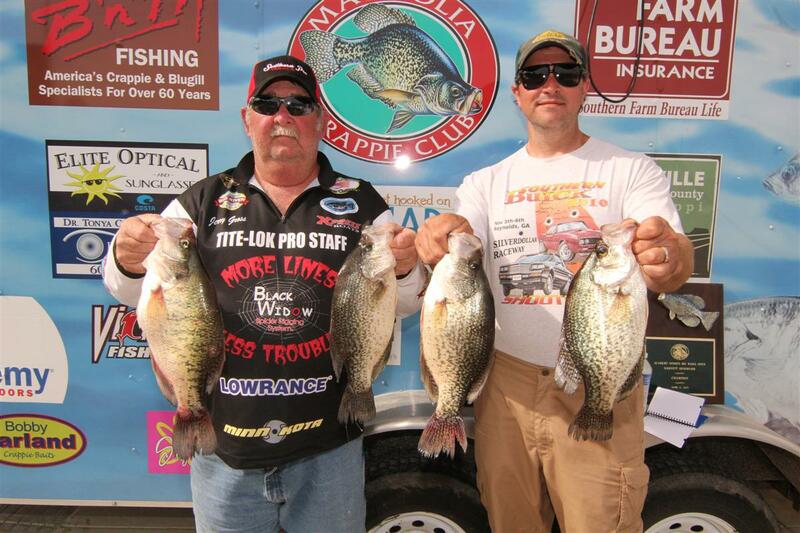 Fishing Crappie Masters two weeks prior was a big advantage. Our bite started early and lasted till about 10am. After that it was slim and none”. Second year team Jeremy Aldridge and Clint Egbert finished 3rd with 14.42#’s. These guys came on the scene hard and heavy last year, winning 2 MCC tournaments and finishing in the top 5 in the Anglers of the Year race. They fished the Scuna area along with over half the field. 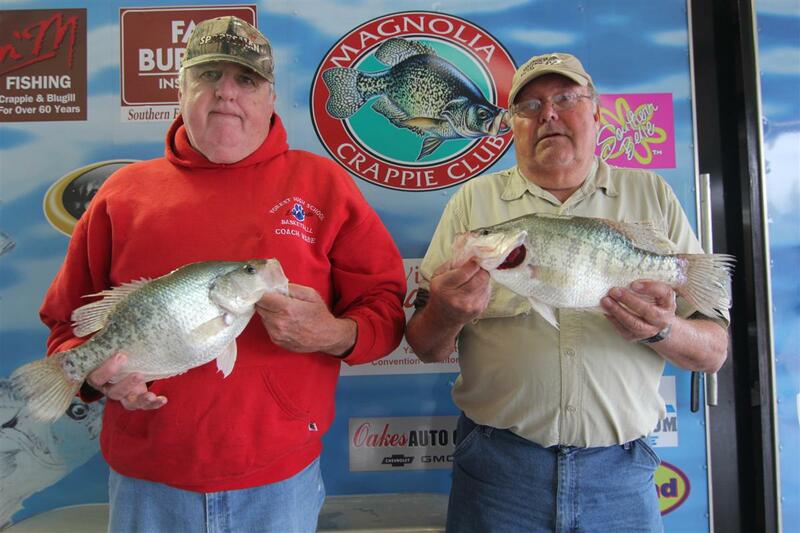 You can’t keep a good dog down long, Kent Driscoll & John Harrison won the Big Mama Open with a 3.03# crappie. These guys are tough to beat on any lake especially on their home lake of Grenada. Ok, speaking of Big Mama’s, we seen plenty. 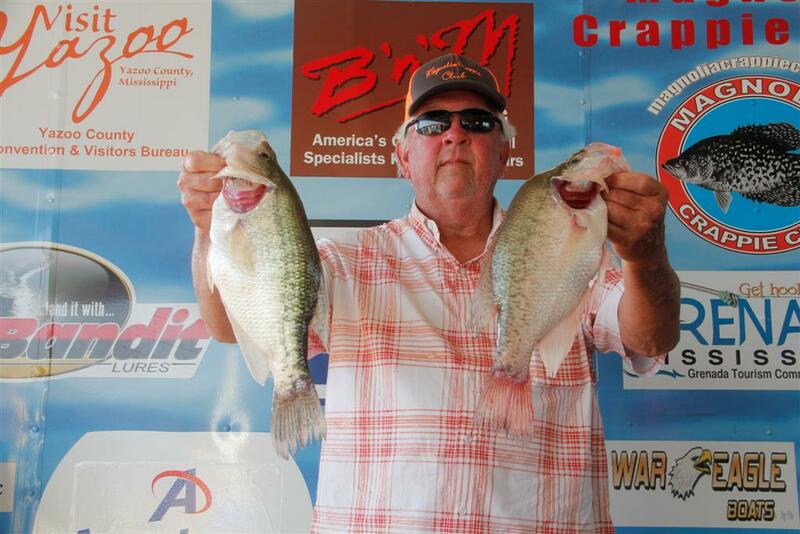 Kent Driscoll of Covington, GA and John Harrison of Calhoun City, MS caught a whopper, 3.03#’s to be exact. The B’n’M Poles & War Eagle Boats Pro Staff Team fished the Choctaw Landing area of the lake and weighed 12.38#’s. These guys are class acts, they donated the $500 in B’n’M Bucks they won using B’n’M poles back to MCC. I know of no one that would even consider doing that. Thank you Kent and John. Bless you my friends. Did I mention we had teams from Arkansas, Tennessee, Mississippi, Kentucky, Georgia, Alabama, Illinois, and Missouri. That’s not too shabby for a little ole crappie club down in Mississippi. We must be doing something right or we wouldn’t have had 48 teams fishing our regular club tournament and 54 teams fishing the Big Mama Open. We weighed 268 fish for a total weight of 437.84#’s. The average fish weight was 1.63#’s and average number of fish per team was 5.68 fish. The average weight per team was 8.94#’s. I know of no lake in the country that has those type statistics. Guess that’s why the parking lots are filled with out of state tags. 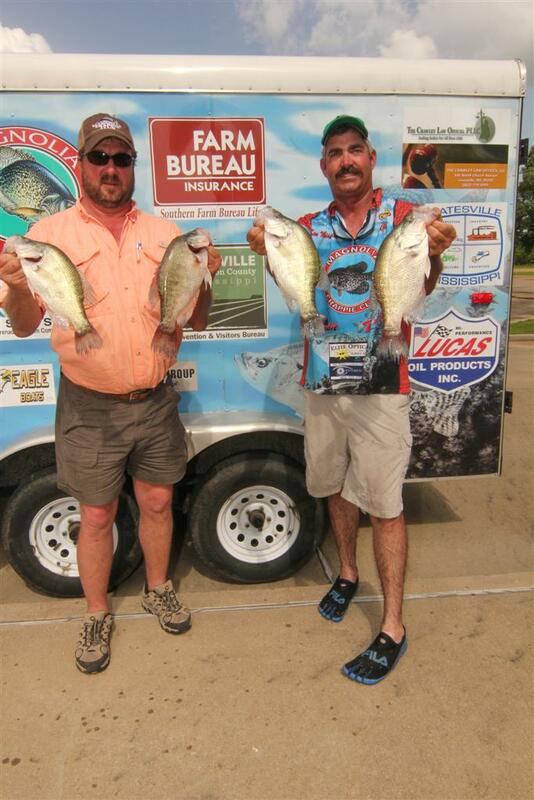 We were blessed with sponsors from Lake Fork Tackle and Mid-South Tackle. Anne and Ronnie Parker from Lake Fork Tackle provided us with lots of giveaways (soft plastics & rod socks) for the fishing teams. 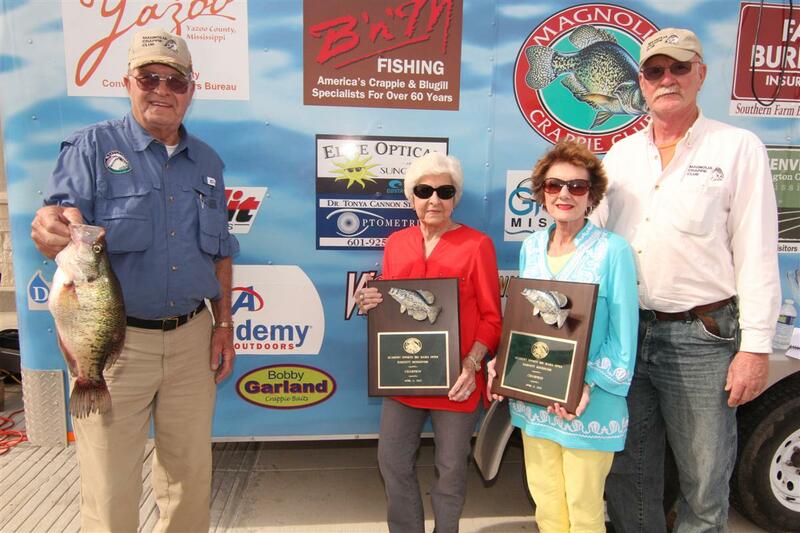 Doyle and Phyllis Hudson of Mid-South Tackle agreed to continue their team sponsorship of their MCC Team (Vic Finkley and Kim Gray). 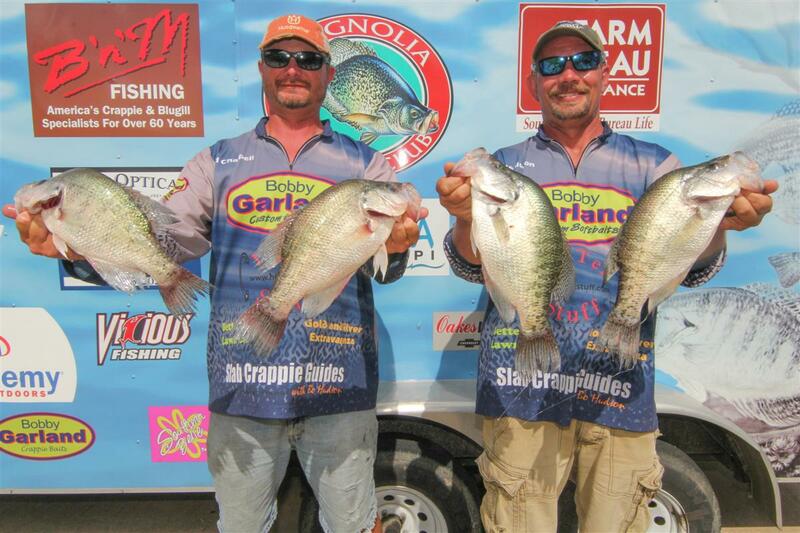 Brad Chappell & Bo Hudson weighed 15.09#’s to finish 2nd at Grenada. The Bass Pro Shops & Bobby Garland Pro Staff Team is extremely hard to beat. Clint Egbert & Jeremy Aldridge weighed 14.42#’s to finish 3rd. These guys consistently make the top 5. Good job, way to go………. Johnny Walker & Tom Robinson finished 4th with 13.92#’s. Johnny & Tom could be the new team to watch this coming year. Nick Sullivan & Johnathan Pitcock weighed 13.68#’s to finish in the 5th spot. This rookie team could very well be our Rookie of the Year Team. We say congratulations to Charles Lindsay with 7 fish weighing 8.79#’s and a big fish weighing 1.54#’s. You did excellent without Charles Jr.—Let him sleep though the next tournament too. And we’re off, coming around the first turn we have team Lindsay pulling off from the pack, going down the stretch coming into the last turn team Lindsay and team Horton running neck and neck. Crossing the finish line it’s team Lindsay crossing the finish line; and the winner is Charles Lindsay with 8.79#’s followed closely by Chris and Kevin Horton with 8.64#’s. The fishing for me was horrendous, horrible, and awful; you get the picture. I’m just not use to fishing where there’s so few fish. I did manage to catch a few small dinks; several had scales missing from being in the mouth of gar. Speaking of gar, there was no shortage of these scavengers; they were everywhere, on the edges and in the middle. I never like to write about the negatives of any fishing adventure but this one deserves mentioning. 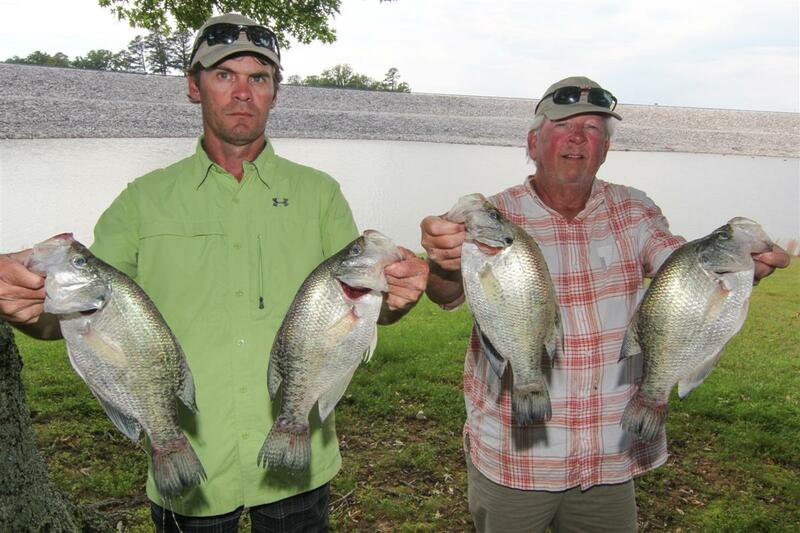 Wolf Lake was once a great crappie lake; man you could catch a cooler full of slabs before lunch. The flood of 2011 and the drought of 2012 did a number on the river oxbows. It’s gonna take a few good spawns to correct the problem; and just as always mother nature will correct itself if and only if we keep our hands out of the picture. Rabbit Rogers and Pat Jeffcoats finished 3rd with 7.77#’s followed closely by Shelton Culpepper and David Thornton with 7.71#’s. 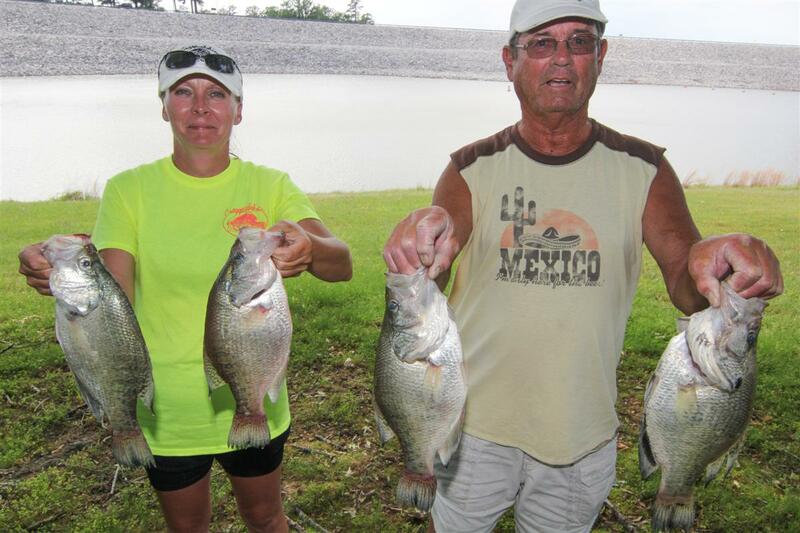 Rounding out the top 5 was Jerry Gross and his wife Debbie with 7.2#’s. Jerry’s partner Bill Burnett had other obligations and couldn’t make the trip; thank you Debbie Gross for filling in for Bill. 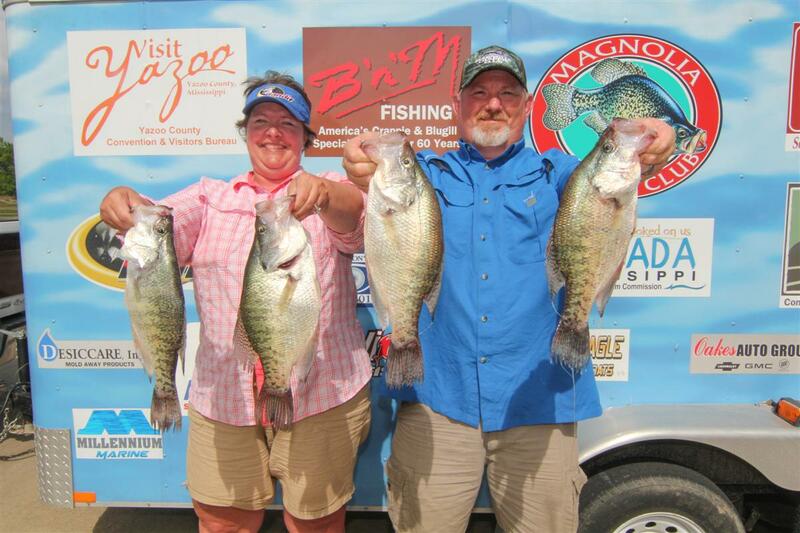 Team Jerry & Debbie Gross (not pictured) captured the big fish prize with a 2.18# slab. Didn’t know Wolf had fish that big; guess y’all proved me wrong again. Congratulations and good job. As I stated earlier, thanks to the wonderful staff and Board with the Yazoo County CVB. They always go out of their way to make sure we enjoy our visit with them. They’ve been doing this for years. We’re continuing our support of them as they continue to support MCC. 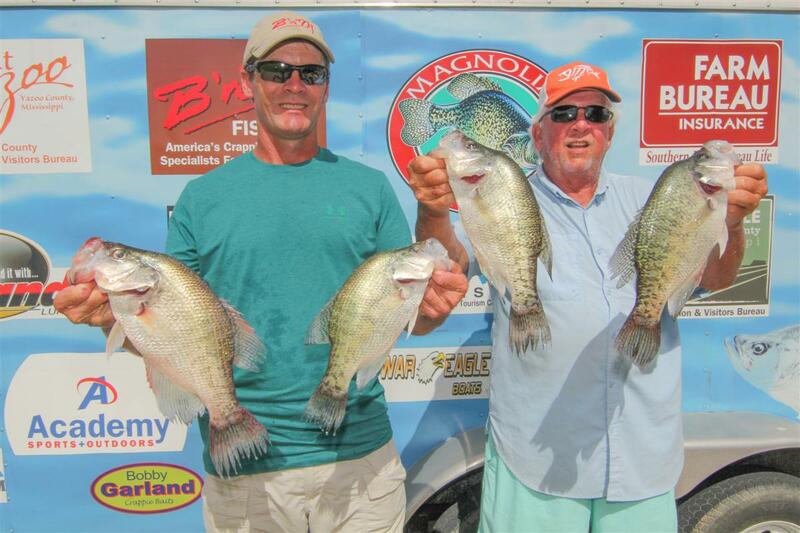 Our next tournament will be on the world famous Grenada Lake. We’ll be rolling in there on an around October 25th. 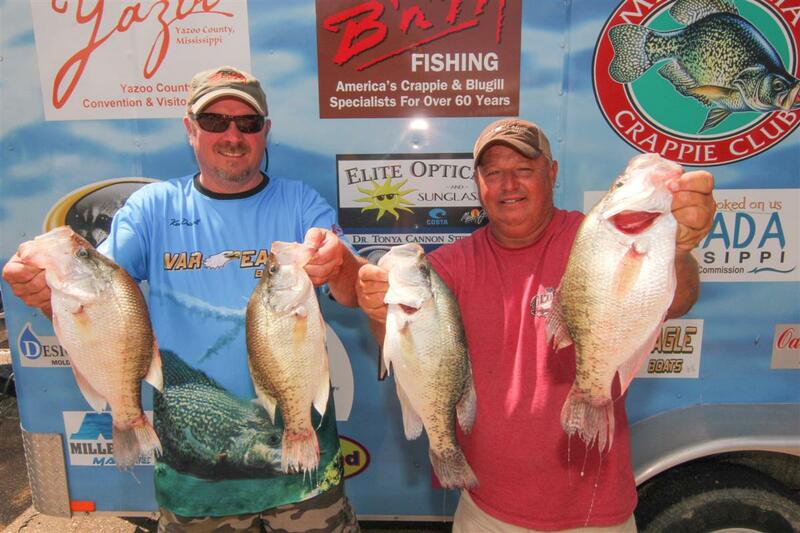 Many of our teams will fish the Crappie Masters National Championship on Lake Washington in September. Good Luck guys, we’re keeping our fingers crossed that one of you will be standing on stage raising that championship trophy and collecting those two Nitro Boats. 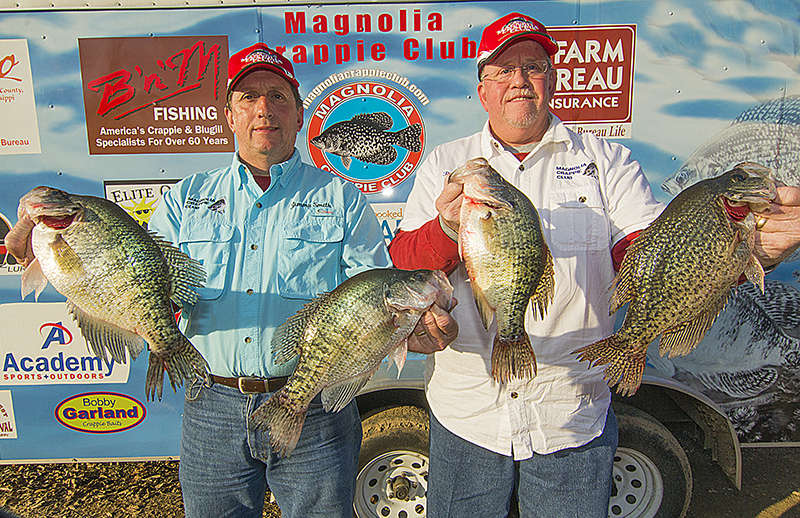 It can happen, MCC has some of the world’s best crappie fishermen. Don’t let them guys come to our house and show out, you show them “Who’s The Daddy Around Here”. I’m reaching out to all MCC Members when I say let’s go out and get some sponsors. Each team needs to bring in at least one sponsor. We have many levels of sponsorships—from $150 to $5,000. No sponsorship is too small. Sell them an ad in this newsletter. It’s good for us and them too. Second year team Jeremy Aldridge & Clint Egbert secured a standing $5,000 sponsorship from the City of Batesville to bring the 2015 Championship to Sardis / Enid. Thank you Jeremy & Clint. When I say “Standing”, that means they will give us $5,000 each time we bring our 2-day championship to Batesville. We’ll be weighing in at the Civic Center with police escorts and all that good stuff. You know, kind of like the Bassmasters. So when you run into Jeremy or Clint, be sure to thank them for their work. Kevin & Chris Horton weighed 8.64#’s and finished 2nd. Their 1.73# big fish went a long way to push their weight almost to the top. Pat Jeffcoats & Rabbit Rogers finished 3rd with 7.77#’s. Rabbit & Pat consistently make the top 5. Good job, way to go………. Shelton Culpepper & David Thornton finished 4th with 7.71#’s. Guess that 5 or 6 days of practice really paid big dividends. 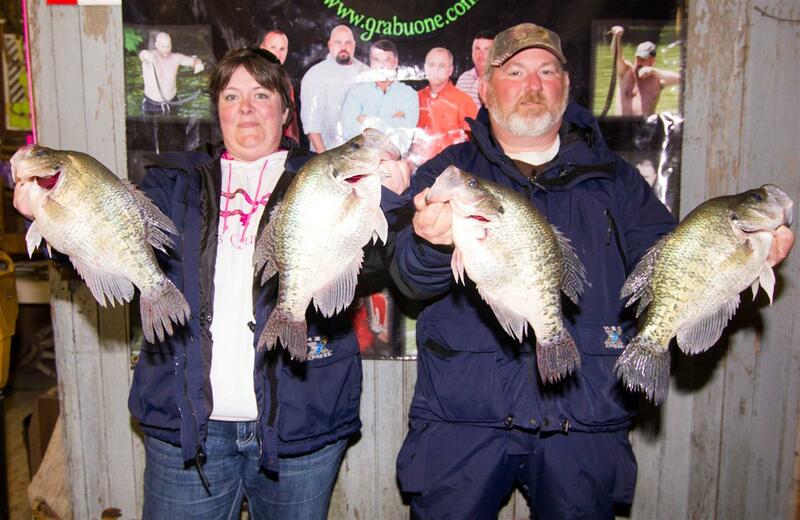 Jerry & Debbie Gross weighed 7.29#’s to finish out the top 5. Bill Burnett couldn’t make the trip and Debbie showed her stuff.